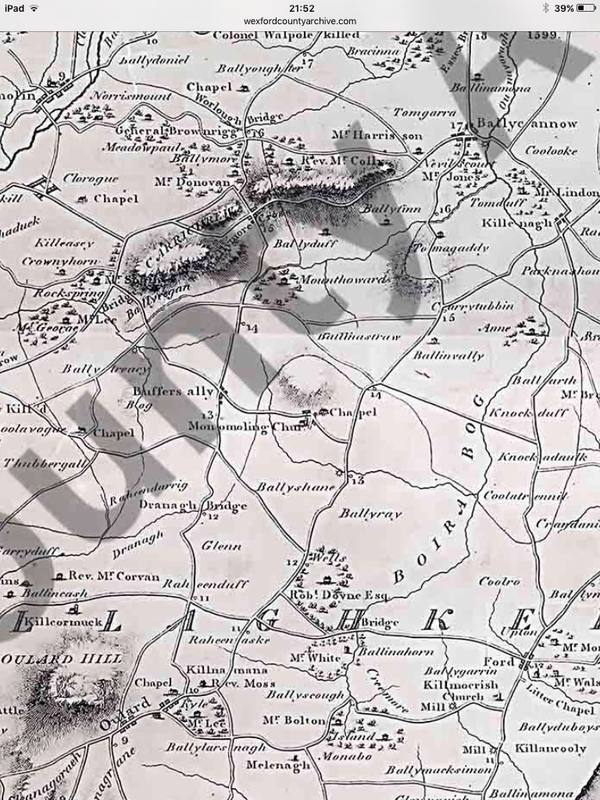 The Kilpatrick family of Dublin, formerly Armagh, and the Cranwill family of Dublin City and Ballycanew, Wexford, have without a doubt been the most pleasurable and successful areas of my Irish family research. My paternal Grandmother Mabel Jackson Wise’s mother was named Agnes Amelia Kilpatrick. This information I discovered on Mabel’s birth record. I had never heard of Agnes, the wife of George Edwin Wise, however her oval photographic portrait and that of my Great-Grandfather Wise had hung as a pair above our sideboard in the dining room at our home, Routala, Wunulla Road in Point Piper as a child. My understanding from my dad, Reg Robson, was that they were my great-grandparents, I knew nothing more. Finally I now had a name to put to the lovely photograph of my Great-Grandmother Wise. See her photographic portrait on the next page. My earliest endeavours uncovered the Wise line, and led me back to Ireland; however, the Kilpatrick line stalled for some time with Agnes Amelia Kilpatrick, because I didn’t know she was Irish. 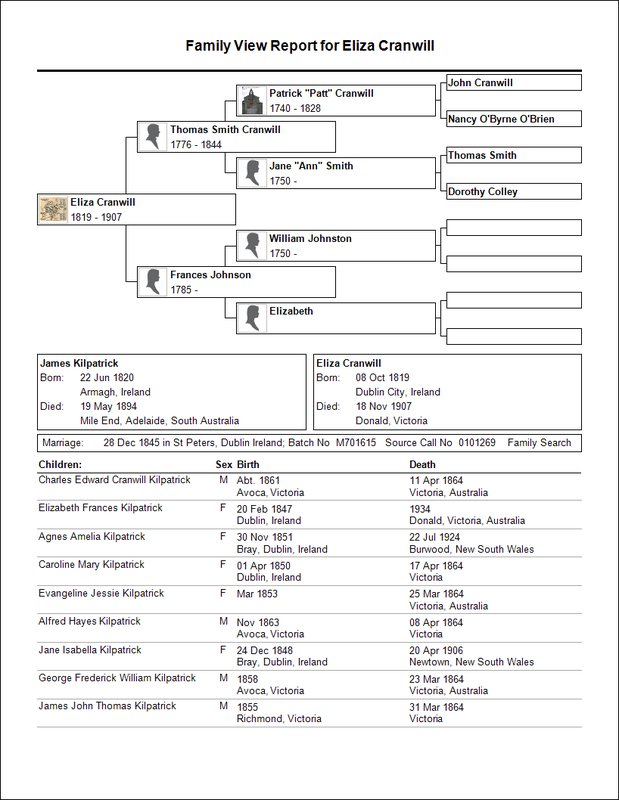 I spent quite a bit of time searching for an Australian birth index for Agnes without success, and then moved onto other areas of the family tree. I also deliberated over the interesting middle names that Agnes had given to her children, the clue here was that she was obviously giving family names to them, for instance, Edna, her third daughter was given her own surname of Kilpatrick, and other siblings were given names such as Jackson, Murray, Cranwill, Evangeline and Raymond. The puzzle started coming together when I found Agnes’ death record, giving the names of her parents, James and Elizabeth, and giving me another generation to place into the family tree. John Borthwick’s Wedding Album, Drawing Room, Fox Hills, from Irene Borthwick, Surrey, England, sent to her sister Mabel Robson, Drayton, Rose Bay in Australia. 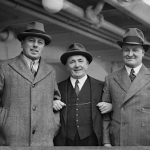 In 2014 I was tidying up my mother’s apartment at Point Piper, when I came across a wedding album for Sir John Borthwick’s marriage to Irene Heller, on 4 November 1939 in Surrey, England. John Borthwick being a first cousin to Dad; their mothers Irene and Mabel Wise were sisters, the daughters of George Edwin Wise and Agnes Amelia Kilpatrick. 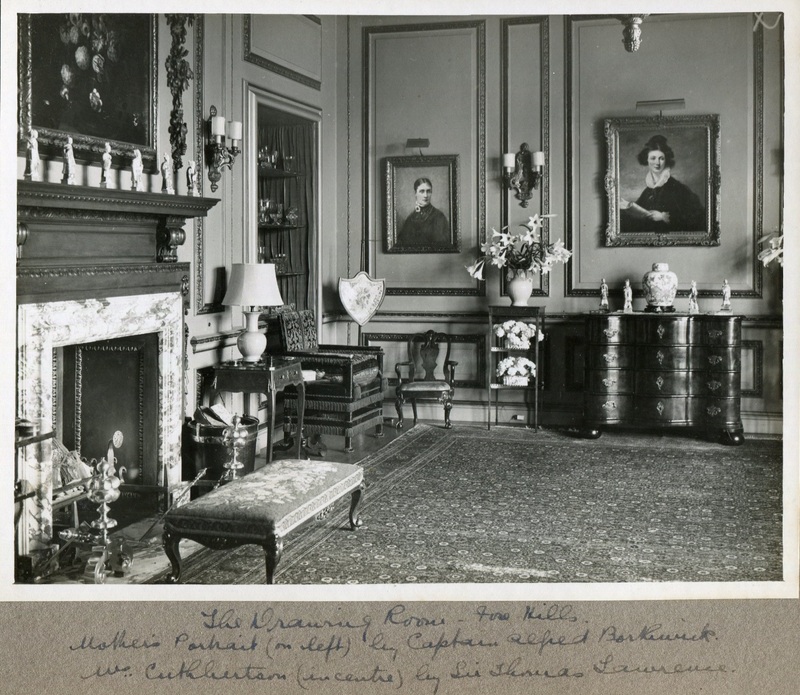 The album had the name Mabel written in Aunt Irene’s handwriting on the front cover, and you can see the photograph illustrated above with her unmistakable writing describing the drawing room at her magnificent home, Fox Hills in Surrey, England. Irene must have compiled this album for her sister, Mabel Robson and sent it to her home, Drayton at Rose Bay in Sydney, Australia. My father, Reg Robson, must have inherited this album after the family home was sold in 1950, and it lay undisturbed for years in a box of treasures, firstly in my father’s dressing room cupboard at Routala, 64 Wunulla Road, Point Piper and later, in my mother’s bedroom cupboard at 52 Wunulla Road, Point Piper, after mum moved just a few houses us the road in 1997. Aunt Irene Borthwick was dad’s favourite aunt, and he gave me the middle name Irene in her honour. Aunt Irene was an amazingly generous hostess, and over many decades she would always entertain my father and mother at Fox Hills in Surrey and at her town house, Eaton Square in London, when visiting from Sydney. In 1953 my father and mother were invited to Westminster Abbey to attend the Coronation of Queen Elizabeth II. Dad had done an enormous amount of work for the Liberal Party and he was honoured by this invitation. Aunt Irene later invited mum and dad to stay at Fox Hills in Surrey, where they attended Royal Ascot. I can remember visiting Aunt Irene at her magnificent London terrace in Eaton Square in London, with my parents, Vena and Reg and my sister Lavinia in May 1975, and again in January 1982, when I took my husband Geoff to introduce him to Aunt Irene, after a ski holiday in Switzerland and Austria. Dinner with Aunt Irene was always a very formal affair, and her faithful butler Smith was always on hand to look after everyone. To my amazement the album showed a portrait hanging on the walls at Fox Hills of Agnes Amelia Wise, Irene and Mabel’s mother. A photograph of this portrait had hung on our dining room wall at Point Piper for years and it must have been Aunt Irene who commissioned her mother’s portrait. 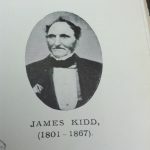 My research on the Wise family of Avoca, country Victoria, Australia, shows that James Kilpatrick and William McOboy Wise were partners in the Kilpatrick Wise General Stores in Avoca and Percydale during the Victorian gold rush. Their children Agnes Amelia Kilpatrick and George Edwin Wise grew up together, probably helping out in their fathers’ general stores, marrying at Avoca, Victoria in 1873, the same year that George’s father William McOboy Wise died so tragically, after being thrown from his horse. It was sad to realise that, like my own children, George Wise’s children would never have known their grandfather. I was unsuccessful in finding the death records for James and Elizabeth Kilpatrick amongst the Victorian records from Avoca, and this was where I became stuck. Not knowing when they died was also difficult as there were possible records I could see, but I couldn’t know which one was correct. It was quite by chance that I found the Kilpatrick family grave at Avoca cemetery. Earlier I had found that Avoca cemetery was where so many of the Wises had been buried, and I had obtained photos of their graves from Carol Judkins, a photographer and researcher. It was on a hunch that I searched Carol Judkin’s website again, and found a long listing for Kilpatrick, and there was the name Cranwill listed amongst the Kilpatrick family’s middle names. I excitedly emailed Carol for photos of the Kilpatrick family headstones at Avoca cemetery. You will see from this email below that it was early in my research on ancestry.com.au (Ancestry) and I still had no real idea about the Kilpatrick line. Re:KILPATRICK George Frederick William, Evangeline Jessie, James John Thomas, Alfred Hayes, Charles Edward Cranwill, Caroline Mary, Eliza, James. Without waiting for a reply from Carol I started my own search on ancestry.com for these people and what unfolded in the space of the next few hours on a rainy Sunday morning, was a story of such unbelievable sadness, that it was difficult to comprehend. 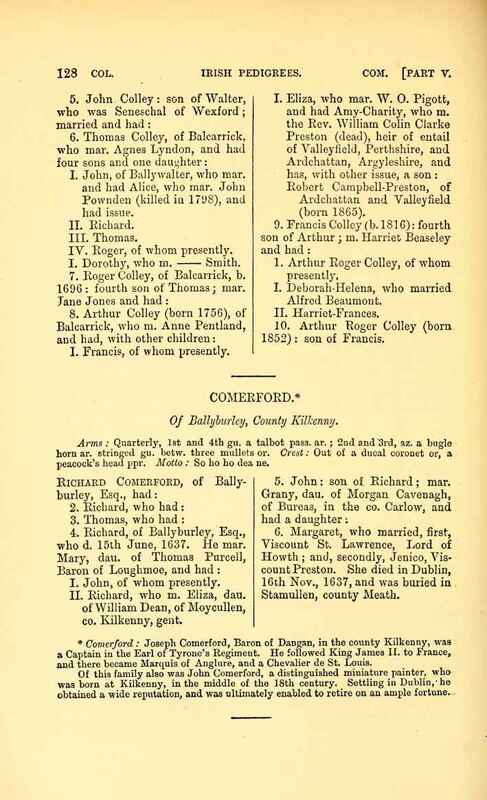 I collected six death records and the corresponding cemetery indexes for the Kilpatrick family, and it became apparent that I was in the midst of uncovering a family tragedy, where, in the space of three weeks in the autumn of 1864, six of the young children of James and Elizabeth Kilpatrick all died and were buried in Avoca Cemetery. A bleak mood overtook me, and I instinctively knew that the children must have died from an epidemic that swept through their Victorian township. Sure enough a quick Google of Australian epidemics uncovered a diphtheria epidemic in 1864 that took such a shocking toll on our family. It is hard to imagine how James and Elizabeth Kilpatrick coped with this terrible sadness. James and Elizabeth Kilpatrick were Agnes’ parents, a fact I picked up from Agnes’ death record, and it was now probable that Elizabeth’s surname was either Cranwill or Jackson. So much was happening at once, it was hard to absorb the information. On a hunch I went with Cranwill and placed it in my Ancestry tree (Rundle Family Tree) as Elizabeth’s surname, and immediately I had “shaking leaves” all over the family tree! Opening her leaf confirmed Elizabeth’s Irish heritage. A few hours later I received a reply from Carol confirming my fears and giving me an enormous amount of information to absorb, including the news that Agnes Amelia Kilpatrick had been born in Dublin, and that she had another sister, Elizabeth, who didn’t die in the diphtheria epidemic; this was comforting news. The record that was most fascinating was the death record for Elizabeth Kilpatrick, naming her parents as William (Wm) Cranwill and Frances Johnston. They lost a lot of children in the same year and all with in about a month – must have been an outbreak of something. Perhaps diphtheria. Well that lot should keep you busy sorting out who is who. Carol attached a photograph of the grave which stands at the far end of Avoca Cemetery. It is a magnificent and very large marble headstone surrounded by an ornate cast iron fence. When I visited Avoca in 2011 I was unprepared for its largeness and its very peaceful and scenic position in the cemetery, nearby to the grave is a large paddock where merino sheep were quietly grazing and, and in the distance the very dramatic, steep and purple Pyrenees Mountains rise suddenly from the flat plain beneath. I immediately noticed that the records referred to Elizabeth as Eliza, and after seeing confirmation of her name on the Kilpatrick gravestone I decided I would now use the name Eliza. 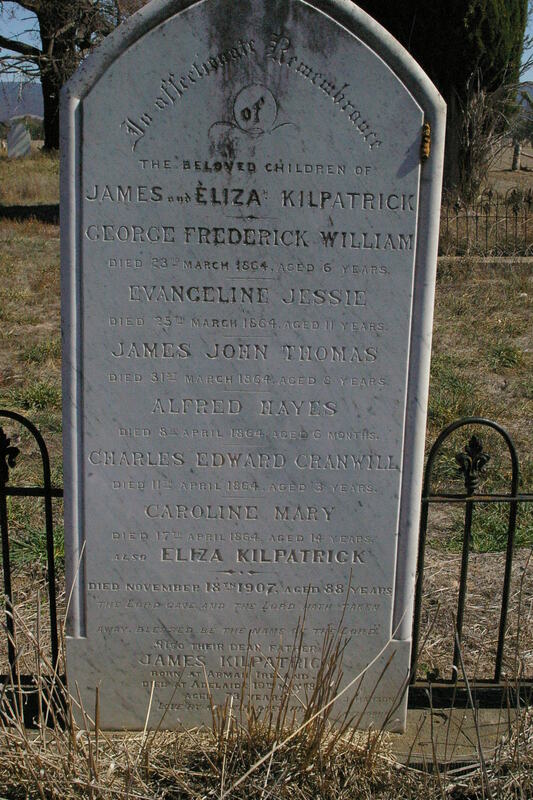 The next page shows the Kilpatrick Family Headstone at Avoca Cemetery, Victoria. My mind was working hard to digest all this information. A planned ski trip to Thredbo allowed me the thought that Geoff and I could then drive to Avoca in Victoria and see for ourselves the countryside where the Wises and Kilpatricks had lived after their migration from Ireland. My sister Lavinia Chrystal was also excitedly planning to join us on our adventure. The excitement of our trip was coupled with the fact that we were able to find a descendant of James and Eliza Kilpatrick’s elder daughter Elizabeth, living in St Arnaud, not far from Avoca in Victoria. This was a woman called Laura Grewer, whose husband Laurence, was the grandson of Elizabeth Grewer nee Kilpatrick. Laurence’s father was James Joseph Kilpatrick Grewer, and it turns out that like Agnes Wise, Elizabeth Grewer named many of her children with traditional Irish family names, including three daughters named Caroline, Evangeline and Frances. Laura was 101 years old and it was wonderful to visit her home and celebrate her attaining such a great age. She had many congratulatory letters on her walls including one from Queen Elizabeth II and, amongst many others, the Prime Minister of Australia. Laura was in good spirits and still living independently, and she put on a spread of cakes, biscuits and tea. Laura had an amazing memory, and she told us the story about the diphtheria epidemic that had struck the Kilpatrick family so grievously. The undertaker apparently refused to attend the Kilpatrick’s home, scared that he would contract the disease and the Reverend and James Kilpatrick had to take the children, one by one to the cemetery to bury. It must have been a terrible ordeal. The Reverend came back each time over the space of five weeks to help James and Eliza bury their children, and to offer prayers. On the last occasion he turned up with a bottle of sulphur dust, and each of the surviving daughters were administered by the Reverend who poured the sulphur mixture down their throats to hopefully stop them from catching the disease. He apparently turned to the parents and told them he didn’t have the heart to keep coming back to their door, and he had heard that this was a remedy of sorts. It probably burnt the girl’s throats, but that was better than dying. It did the trick, and Elizabeth and Agnes survived. The scourge was never ever talked about in our family again. My sister had gone on a road trip to Victoria in the early 1970’s with Dad and would have driven through Avoca. Lavinia says if Dad knew about Avoca he would have stopped; we don’t think he knew about the tragedy or the grave. Just before our ski holiday and road trip to Victoria, I caught up with my second cousin Peter Borthwick and his wife Helen, and they told me that they had a Wise family tree that they thought I would be interested in. Helen very kindly photocopied it, and dropped it into my letterbox the next day. It was exciting to open this material and try to get my mind around all the contemporary information about the Wise and Kilpatrick descendants. Helen told me it was the work of her mother-in-law, the Hon. Irene Borthwick, who had lived all her married life in England. It was obvious that my Great Aunt Irene had kept a close eye on the expanding Kilpatrick family in Australia, and had noted down all the generations, marriages and their children in a most meticulous fashion and it was such a help to me to see for the first time, my father’s large amount of first and second cousins, the majority of whom, I had never heard of. She also had an incredible amount of accurate information on dates and places of births and deaths from Ireland which she wrote into the margins. 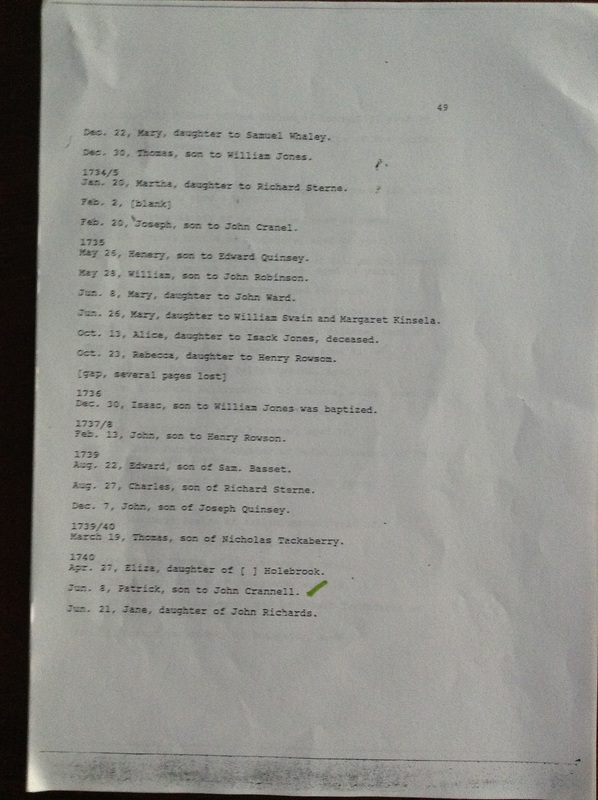 The most important discovery from this document was the existence of yet another daughter of James and Eliza Kilpatrick. Jane Isabella, the second eldest daughter, who was listed as having been born in Bray, Dublin on 24 December 1848. One of the biggest disappointments of my research into the Wises and Kilpatricks, was that I was never able to find out what ships they arrived in Australia on. The Borthwick files claim that the Wises arrived in Sydney in 1851. It would appear that both families were unassisted migrants, and they paid their own way to Australia and as such there are many gaps in these records that were not recorded by the authorities. 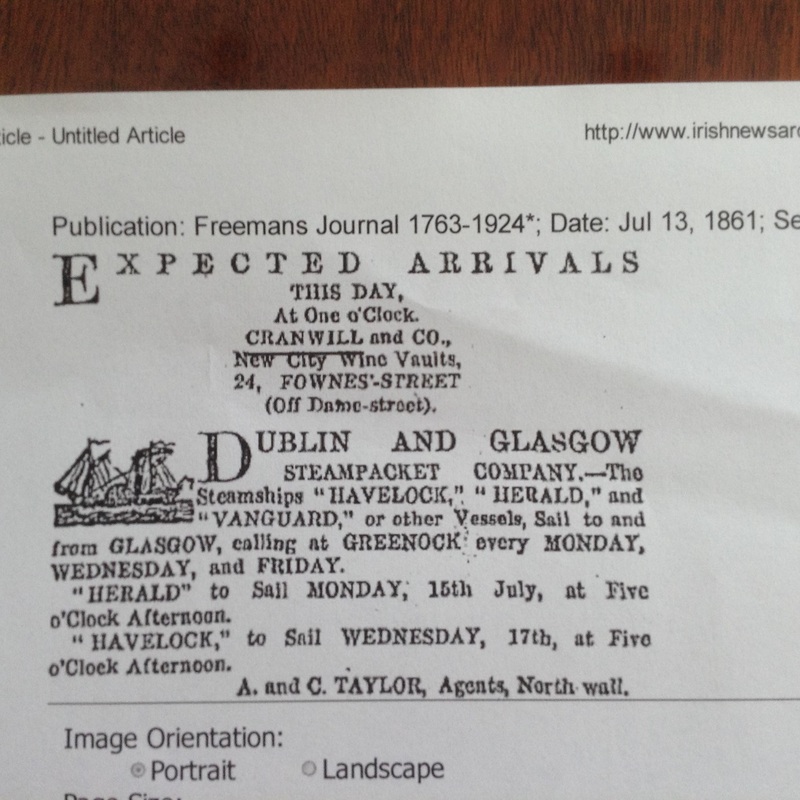 Newspaper columns listing the arrival of ships and passengers into ports by shipping agents are fairly common but a full list is a rare find, and in our case, it was not to be. The next few pages I have illustrated with some family charts and an obituary for Mrs E Kilpatrick. 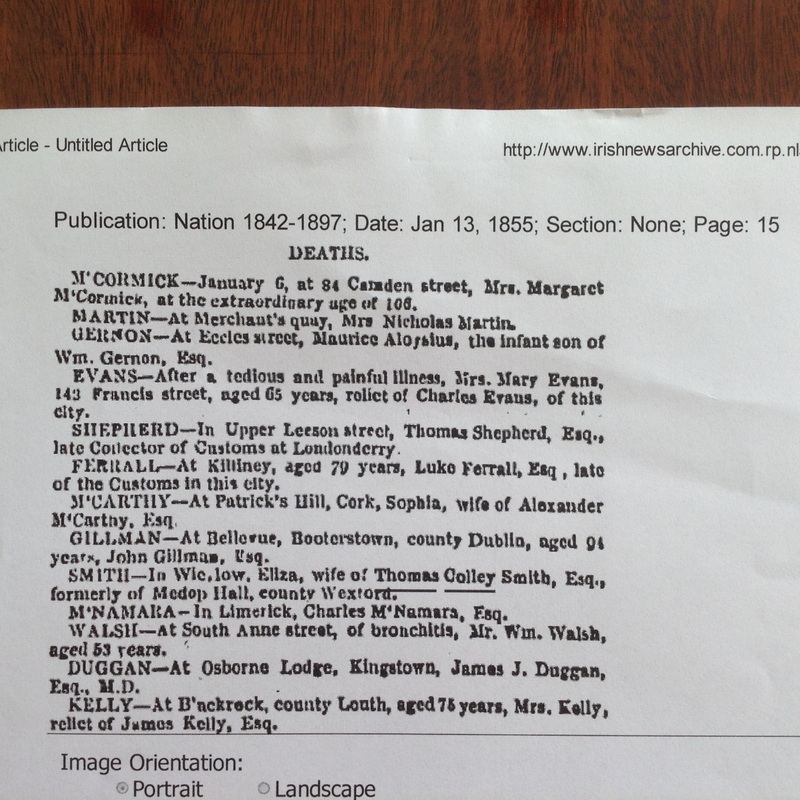 Starting on this page with a Family View Report for Agnes Amelia Kilpatrick, the next page is a “pedigree” chart for my grandmother, Mabel Robson nee Wise showing both the Wise and Kilpatrick sides of her Irish family. Note that the “Family View Reports” do not show the children in chronological order, and I think this is a software problem with the chart maker, Family Tree Maker. 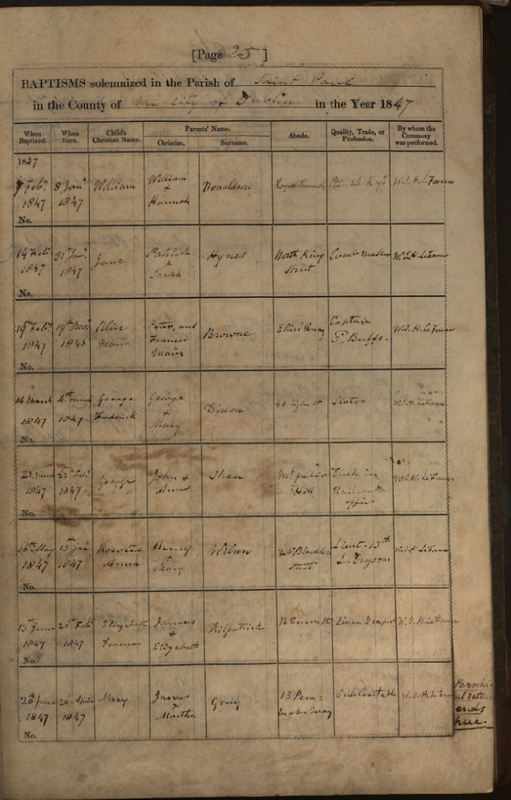 The third chart is a Family View Report for Elizabeth “Eliza” Cranwill. It is pretty amazing to be able to click a button on a computer and come up with many various family reports and charts. There was so much to go through and add to the family tree. 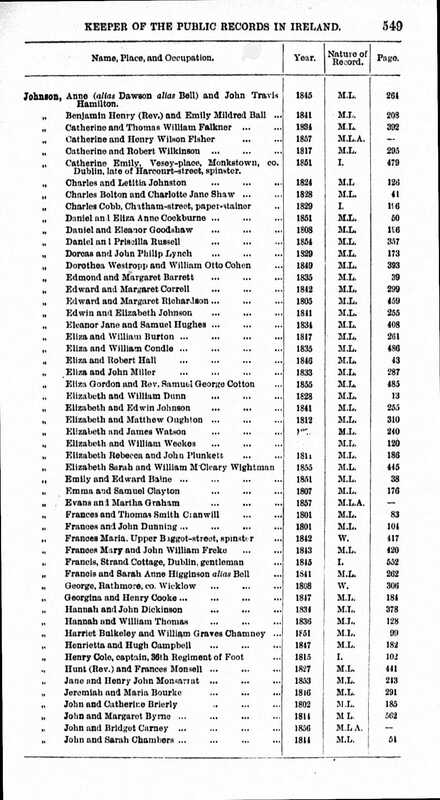 I spent a lot of time checking and adding records and to my absolute fascination it turned out that Jane Isabella Kilpatrick married Henry Wise, another of William McOboy Wise’s sons and just to make sure I had found the correct person, I then found Jane’s death index confirming her parents as James and Elizabeth. It was incredible information that two Kilpatick sisters married two Wise brothers, and both in the same year. I wondered if theirs had been a double marriage with Agnes Kilpatrick and George Wise? The children’s names on the Kilpatrick grave are significant ones, I am yet to work out all the meanings of the middle names, and the name Hayes does warrant further research. Also the name George Frederick William Kilpatrick is significant, as it turns out Jane Isabella Wise, Agnes’ sister named one of her sons Frederick William Kilpatrick Wise, and this cannot be a coincidence. My visit to Avoca is also covered in another family chapter called The Wises of Avoca, however one article I found that is most relevant to this chapter was an obituary on Eliza Kilpatrick from the Avoca Mail, which gave me some more information to answer some of my questions. My sister, Lavinia Chrystal, my husband Geoff and I spent a morning at the Avoca and Districts Historical Society (ADHS) and after joining their Society, we were able to access the Library and copy many documents of interest regarding the Wise and Kilpatricks. In my haste to copy everything, I overlooked this obituary of Eliza Kilpatrick’s for quite some time, and it was not until I went over my research while writing up this chapter, that the obituary literally fell out of a page in my folder, like a gift! So many interesting details are contained in this newspaper article. 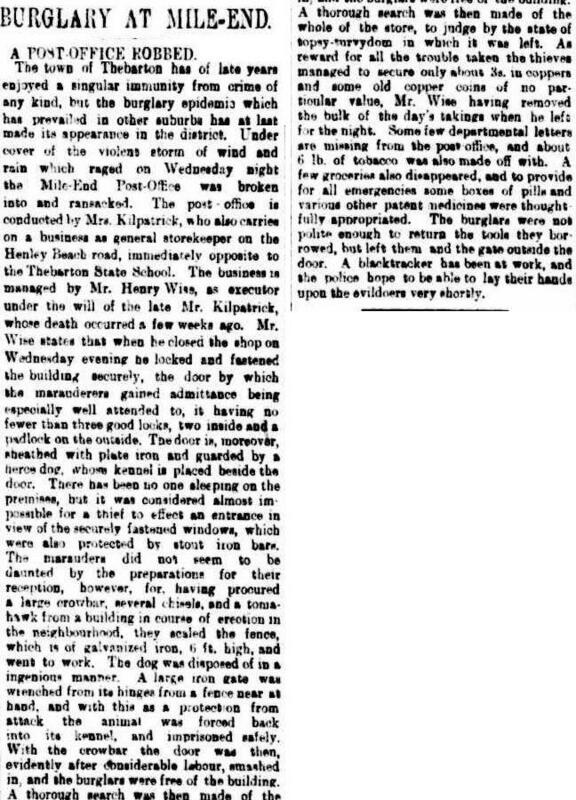 The Kilpatrick’s were running a Post Office on Henley Beach Road, Mile End, South Australia, and according to Eliza’s obituary they had been there since 1880. The shop would also seem to be a general store, similar to the Kilpatrick Wise General Store at Avoca and the fact that Henry Wise, Eliza’s son-in-law was also helping to run the store after the death of her husband James Kilpatrick. 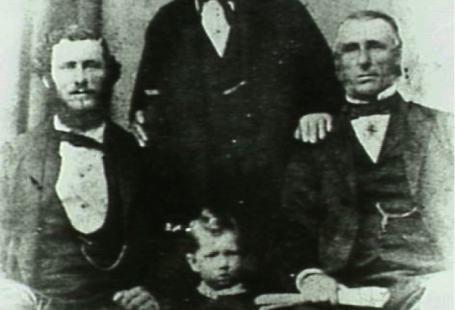 However, nothing explains why the Kilpatrick family moved from Avoca, Victoria, nor why they went to South Australia. It might well have been that there were other family members living in Adelaide, who had also migrated from Ireland. It is also a fact that the Avoca township, after the gold rush was very much a quieter town away from the larger centres such as Bendigo and Ballarat. After the death of William McOboy and the marriages of their three surviving daughters Jane Isabelle Kilpatrick to Henry Wise, Agnes Amelia Kilpatrick to George Edwin Wise and Elizabeth Kilpatrick Frances to John Grewar, it seemed a logical decision for James and Eliza Kilpatrick to move to live near other family members, but I can’t be sure this is the reason and it was a considerable distance to travel. I hope one day soon to solve this part of the puzzle. One important clue from the email of Carol Judkins that was exciting was that the Kilpatrick family was from Dublin, and for the first time I was on the verge of achieving my goal, which was to place our family correctly into their place of origin. However, I was not to realise how absorbing and time consuming this quest was to become. I had for the first time a link on ancestry.com to a family tree in Dublin, and this was to prove a most interesting discovery. I now turned my research to Ireland to find out more about the Cranwills and the Kilpatricks. One thing that was an advantage was the rare and unusual name Cranwill, which has proved to be so helpful in my research. A Kilpatrick born in Armar (sic) as written on the gravestone, was not helpful, as the name Kilpatrick is as common as Jones in Wales. Nevertheless, I didn’t realise how easy it was going to be to find out more about James and Eliza until I Googled their full names into my laptop, and incredibly I came up with a website listing the availability of an original marriage certificate for the couple, all at the click of my mouse button. It was one of my most exciting finds. I was able to see so much information, I could see that both James and Eliza were both literate and could sign their own names, that it was a first marriage for them both and James’ occupation was listed as a draper, which of course fitted right into his occupation in Avoca co-running the Kilpatrick Wise General Stores. 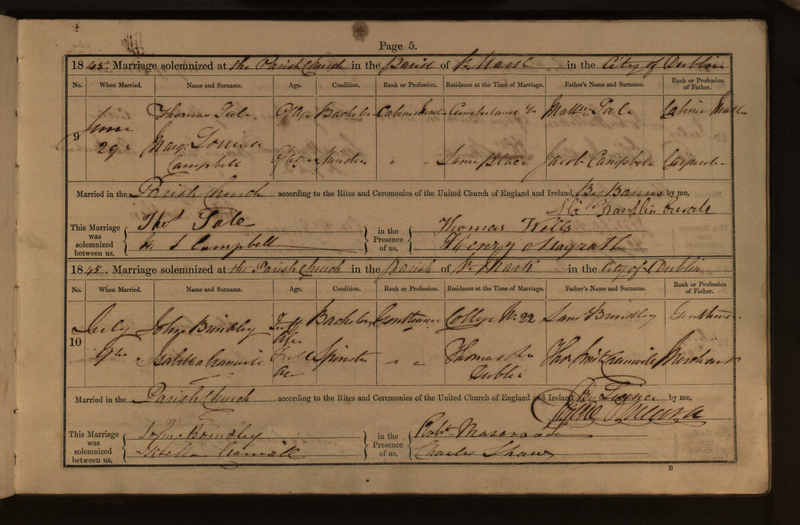 James and Eliza’s father’s were both listed on the marriage certificate which gave their occupations as well. James’ father also named James was listed as a farmer, and Eliza’s father was listed as Thomas Cranwill, a merchant. These occupations were obviously fairly well to do in Ireland. I was gripped with the need to find out more about the Cranwills. The address of the parents is not included, and it well may be that a listed father maybe deceased at the time of the marriage, but not indicated. 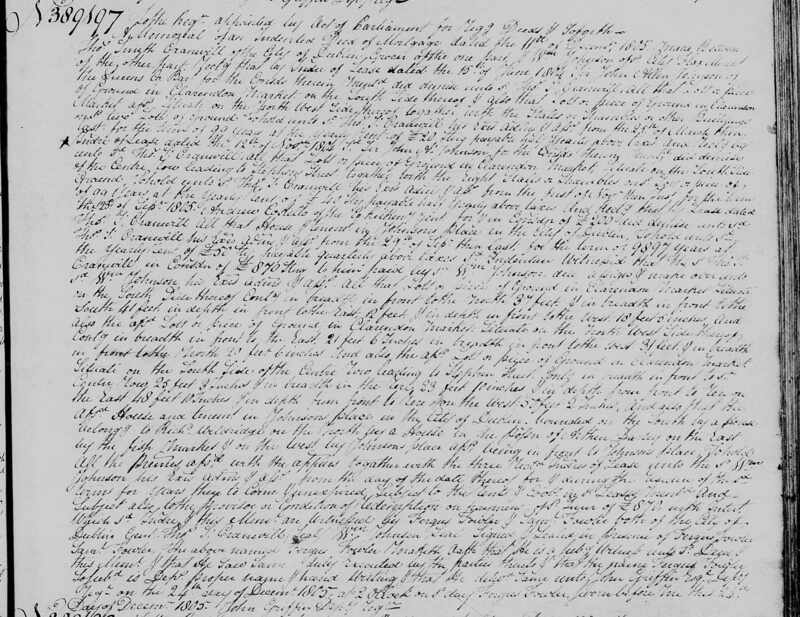 The amazing ability to capture these online handwritten parish records to my own computer was exciting. I now need to acknowledge my son Rowan’s enormous patience and help as he showed me how to capture these PDF records, and then managed to transform them into JPG images so I could place them into my family chapters. The fact that I was now witnessing a document that was original, and was actually signed by both James and Eliza on the day of their marriage was truly amazing. I could see the ink splotches, smears and various handwriting and age spots on these documents; what absolute treasures these documents are! In light of earlier research I had done on the Wise family of Cork, I realised how lucky I was to have these documents, because so many original parish records were destroyed in 1922 when the British forces thought that Irish rebels were hiding out in the building and blew up the Four Courts Building in Dublin. 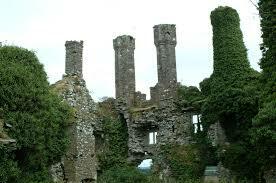 Unfortunately the Irish rebels had placed a stash of gunpowder in the building and the results were a catastrophic fire. See my chapter on the Wise Merchants of Cork. Now I had the correct name of Eliza’s father, and before me I could see Eliza’s other sisters, Isabella, Mary Anne and Emily Cranwill’s marriage records from Dublin at around the same time, each one listing “Thomas”, “Thomas S”, “Thos.” or “Thomas Smith” Cranwill as their father, his occupation also varying from gentleman, to merchant, to grocer. It was so interesting to see these hand-written original documents and analyse them. James and Eliza were married at St Peters, City of Dublin. 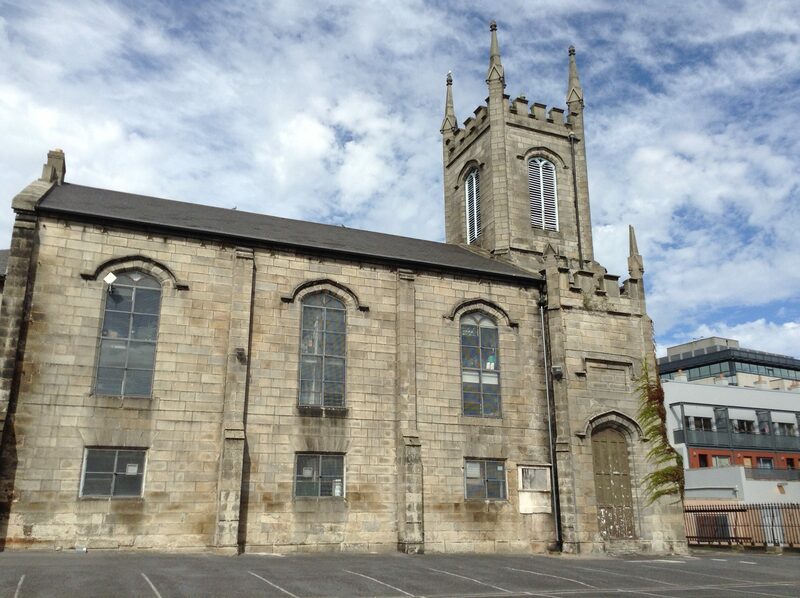 Sadly St Peter’s Church was demolished in 1983 to make way for the Dublin YMCA. 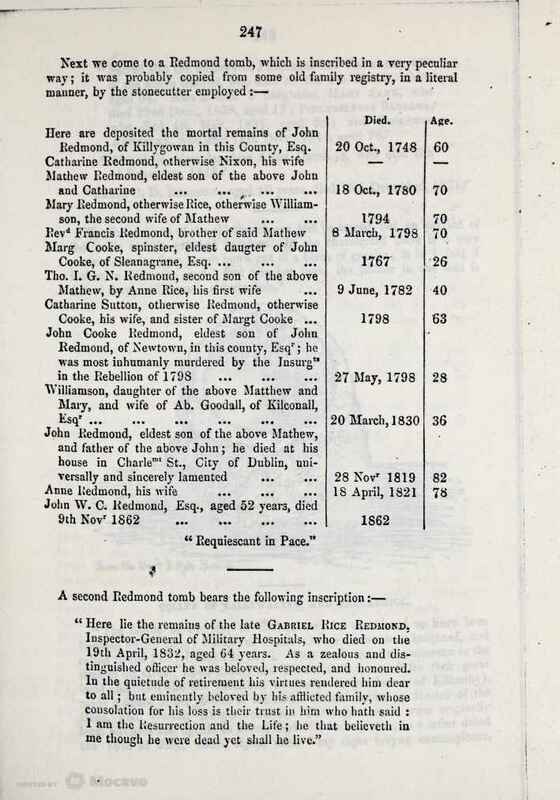 These three records for the marriages of Eliza’s sisters are on the following two pages. James Kilpatrick was a witness to the marriage Eliza’s sister, Mary Ann Cranwill to William Shern who married at Grangegorman Church, Dublin City. 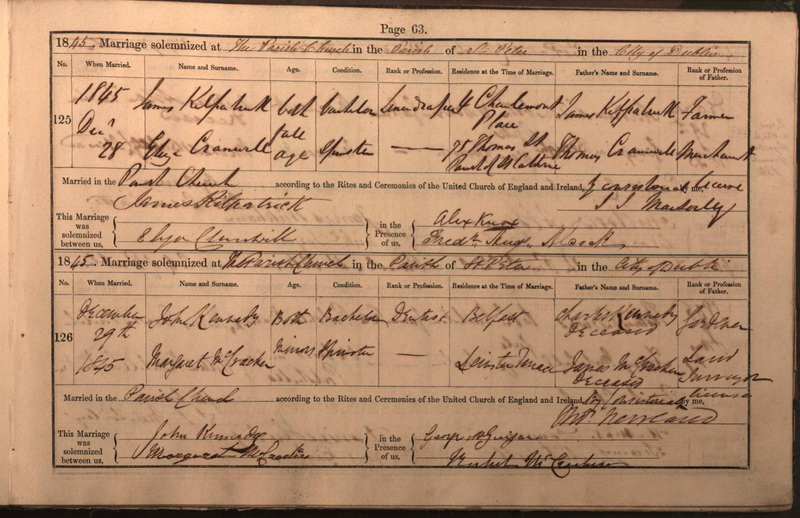 The last two records are the marriages of two more of Eliza’s sisters, Emily Cranwill to William James Holland who were married at St Catherine’s Church, Dublin and Isabella Cranwill to John Brindley, who were married at St Mark’s Church, City of Dublin. 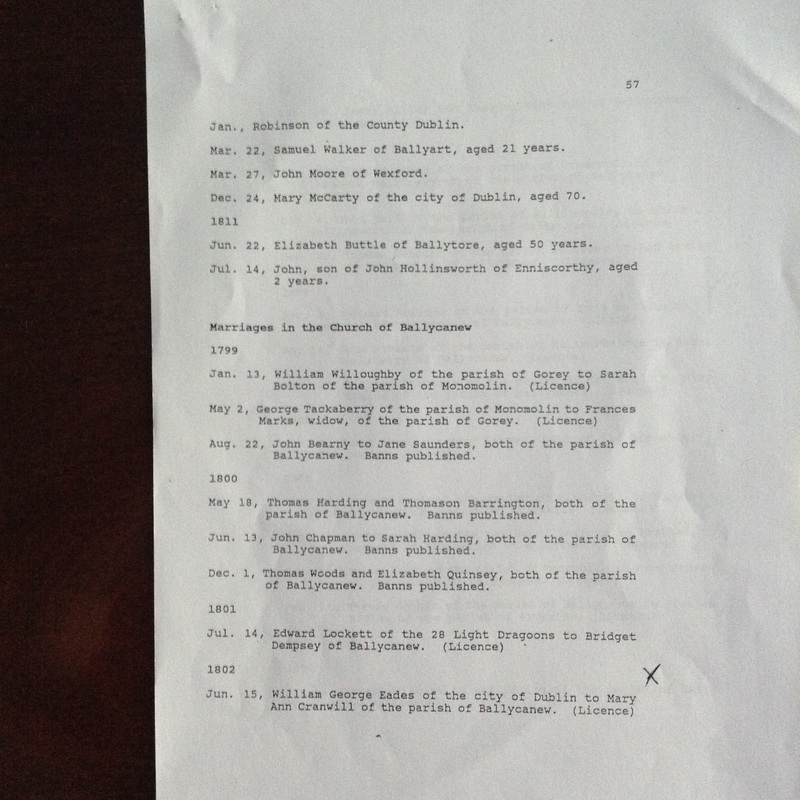 The following three pages are copies of the original Baptisms of James and Eliza Kilpatrick’s three daughters, Elizabeth, Caroline and Agnes at St Paul’s Church, Dublin. They are all listed with the same street address 12 Queen Street, Dublin and their father James Kilpatrick is listed as a draper. I was unsuccessful in finding Jessie Evangeline’s birth record. The rest of the Kilpatrick’s children were born in either Melbourne or Avoca and it occurred to me that it was possible that Jessie may have been born aboard ship on the journey. While it is not certain how long this journey took to Australia, it is also by no means certain when they left Ireland. From the marriage records, this can now be placed after November 1853, when James Kilpatrick was witness to the wedding to William Shern and Mary Ann Cranwill, up to September 1854, when the family apparently arrived in Melbourne (see Eliza Kilpatrick’s obituary from the Avoca Mail November 1907). Another daughter of the Kilpatrick’s was Jessie Evangeline Kilpatrick. At first I investigated the possibility that the unusual name Jessie Evengeline came from the ships that the Kilpatrick family travelled on when they migrated to Australia. It is probable that James Kilpatrick was smitten with gold fever, and that this was the reason he took his large family across the world in search of a new homeland, business in Dublin was depressed and the famine from diseased potato crops was biting hard in the big cities of Ireland just as much as the country areas. The idea of adventure, and visiting exotic new worlds cannot be discounted, and as yet I can find no close family in Australia who would have encouraged their migration from what seemed to be a settled a existence in Dublin I had no answers to my questions. 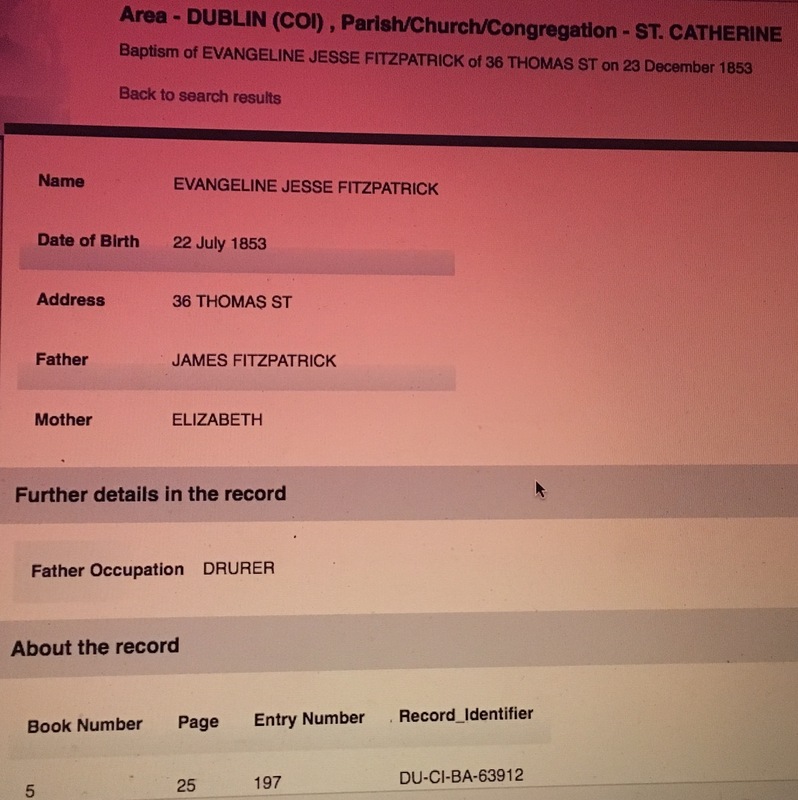 Another search of the Irish Genealogy website produced Jessie Evangeline Kilpatrick’s baptism wrongly transcribed as Fitzpatrick and sadly the baptism is not yet imaged on the website. 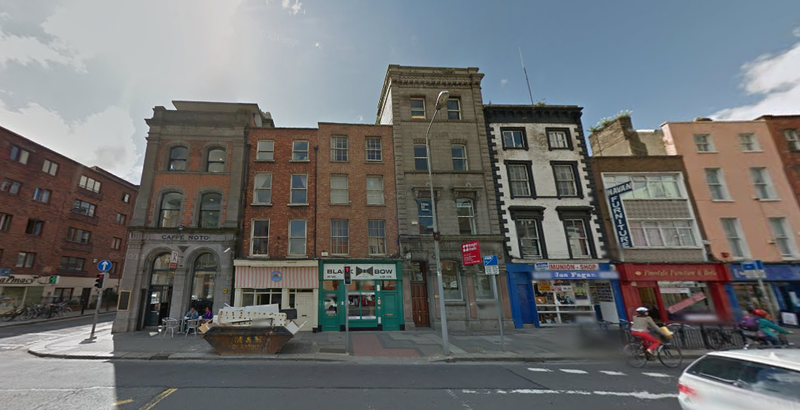 Jessie was baptised at St Catherine’s Church and it can be seen that the family has moved to 36 Thomas Street, Dublin. James’ occupation is incorrectly transcribed as a Drurer, but I am confident that this record is correct for our family. 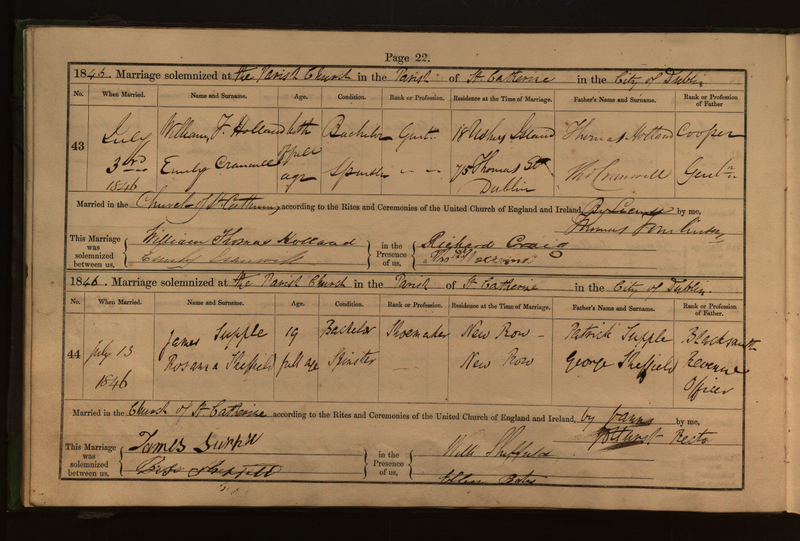 Baptism of Evangeline Jesse Kilpatrick at St Catherine’s Church, Dublin, 23 December 1853, 36 Thomas Street. It was particularly exciting to find the very precious Baptism record for Agnes Amelia Kilpatrick, my great- grandmother, especially knowing how rare these records are in Ireland. I also tried to find the Baptism for Jane Isabella Kilpatrick, Agnes’ elder sister, but was unsuccessful. 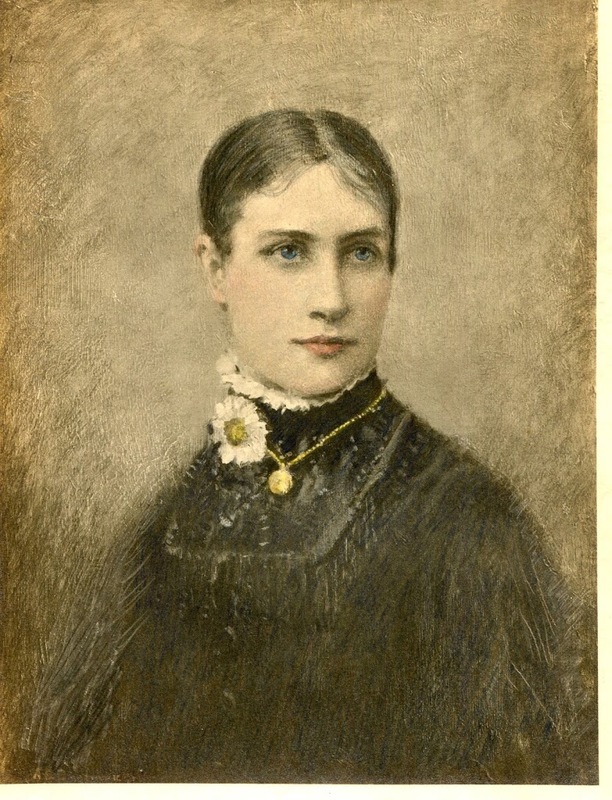 Jane married Henry Wise, the eldest brother of George Edwin Wise in 1873. It is possible they were visiting other family or friends for Christmas, as Jane was born on 24 December, and Jane Isabella may have been baptised during the visit. I was able to pour over the marriage documents for Eliza and her sisters, and notice small changes to her father’s name and occupation, on some records he was listed as grocer, merchant and gentleman. On Isabella Cranwill’s marriage record he listed his middle name as Smith. I was in no doubt that this would probably be another maiden name in the family, and I placed this name as his mother’s maiden name, just as I had placed Cranwill as Eliza’s surname in my ancestry family tree. Keen readers will have noted the error on Eliza Kilpatrick’s Australian Death Record, which gives her father’s name as William and not Thomas. Errors on death records are common because the person giving the information may not be a close relation, or so much time has passed that the details are forgotten. It is for this reason that the family researcher relies more heavily on baptism and marriage records than death records. It was also exciting to have Eliza’s mother listed as Frances Johnston. At first I thought this surname may have been an error, knowing that Mabel Wise’s middle name was Jackson. The surname Jackson has no connection with any family document during my research in Dublin. Mabel’s middle name of Jackson, may have been an error, and it should have been Johnston? 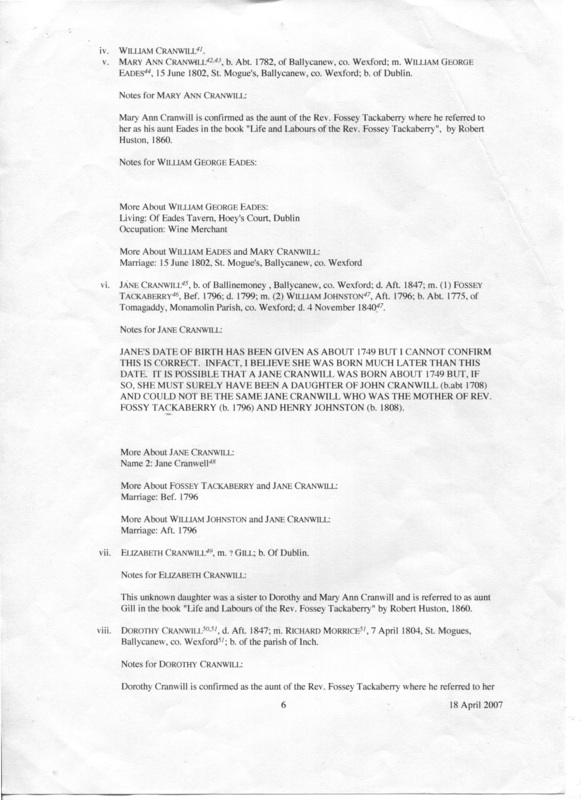 Almost immediately I found other family links to Thomas Smith Cranwill on Ancestry citing his father’s name as Patrick or “Patt” Cranwill of Ballycanew, Wexford, and his mother as Jane or Jane Ann Smith. 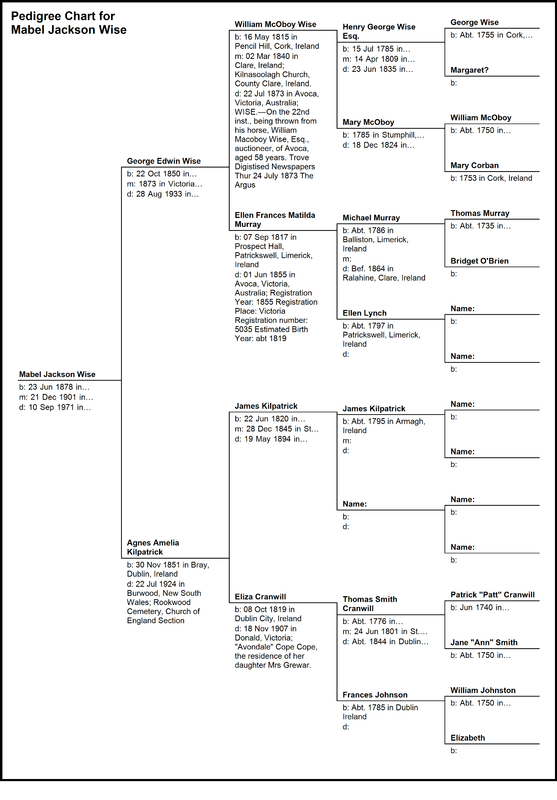 In the next few pages I have placed several family charts to help understand the complexity of this large Dublin family. 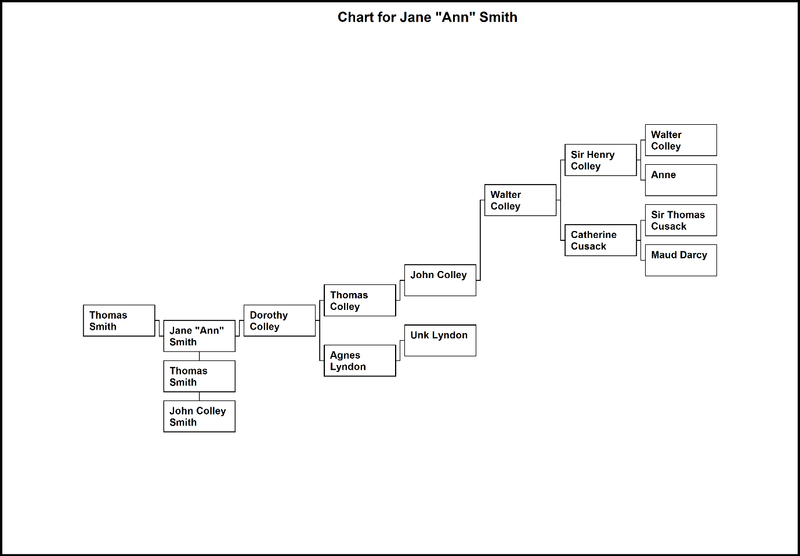 The next illustration shows Agnes Amelia Kilpatrick’s Family Chart. Starting with James Kilpatrick, I will show how my Dublin research developed over many months. I spent time placing the new extended Cranwill family members into my family tree, and endeavoured to find out as much as possible about James Kilpatrick – draper of Dublin, and Eliza’s father Thomas Smith Cranwill, gentleman grocer/merchant of Dublin and his wife Frances Johnston. I turned my research to Old Irish Newspapers and had much success finding both James and his father-in-law were men of standing in their community. It left me wondering exactly why James Kilpatrick and his family left a seemingly prosperous upper middle class lifestyle in Dublin, to chase a new life on the other side of the world. It was an especially curious action for a man who had such a large family to look after. 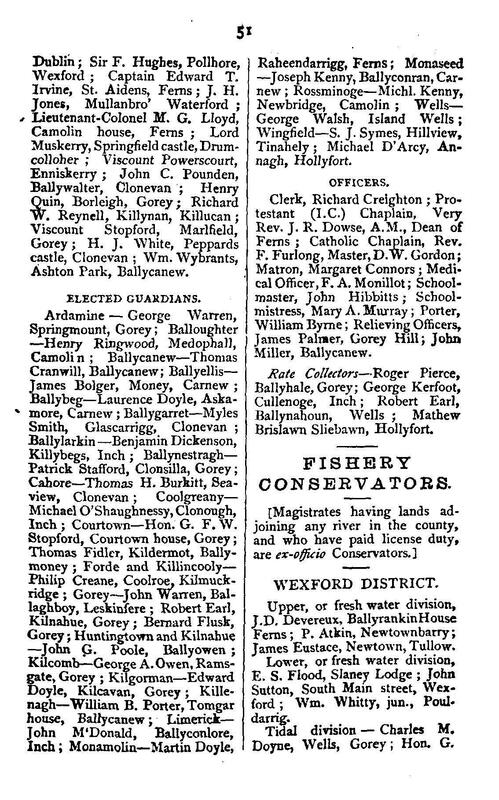 This same entry appeared in Thom’s 1850 Directory of Ireland, on page 968. It occurred to me that the second entry could very well have been James’ father, perhaps living in Dublin in retirement. The Wise/Kilpatrick Family Tree claims that Jane Isabella Kilpatrick was born in Bray, a seaside town in County Wicklow, just south of Dublin. It is possible that this is the reason I have not been able to find her baptism and it is possible that this was where the Kilpatricks farmed or perhaps some of the Cranwill or Johnston family were living. All speculation admittedly, especially since James Kilpatrick is listed as having been born in Armar/Armagh. However, the fact that Thomas Smith Cranwill’s father hailed from the tiny township of Ballycanew in Wexford, it did add credence to these city dwellers also having country properties near to Dublin. Thomas Street Dublin was the home of Eliza Cranwill prior to her marriage to James Kilpatrick and this fact is recorded on their marriage certificate. 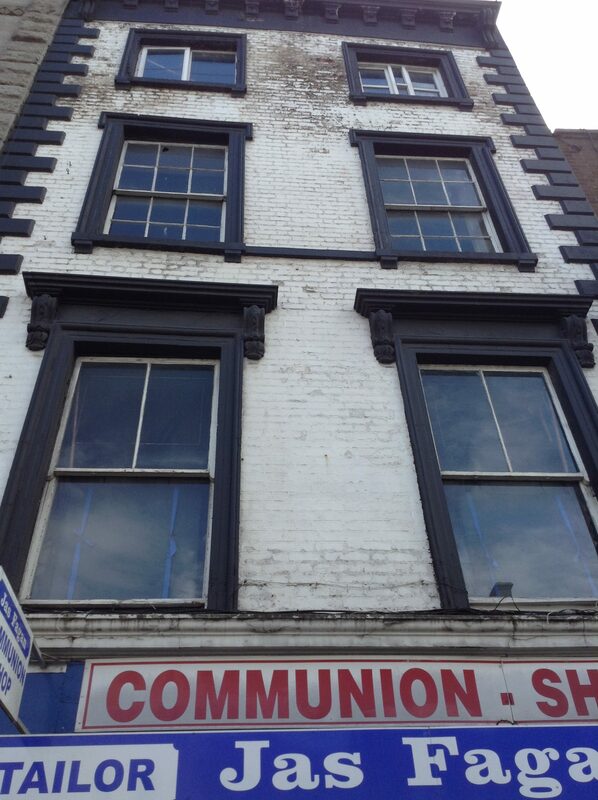 This would have been a home and shop for Eliza’s father Thomas Smith Cranwill who was a grocer and wine merchant. No 75 is the fifth house in from the corner, with white stucco (possibly not original) and brown keystone details. Thomas Street is a fine wide street, close to Dublin Castle, the Four Courts and the River Liffey which runs through the city. Sadly both 12 Queen Street, where the Kilpatrick girls baptisms listed, and 4 Charlemont Place, the address listed for James Kilpatrick on his marriage record have been demolished. It was wonderful that 75 Thomas Street, a Georgian building, still survived in Dublin, and hopefully has been heritage listed. 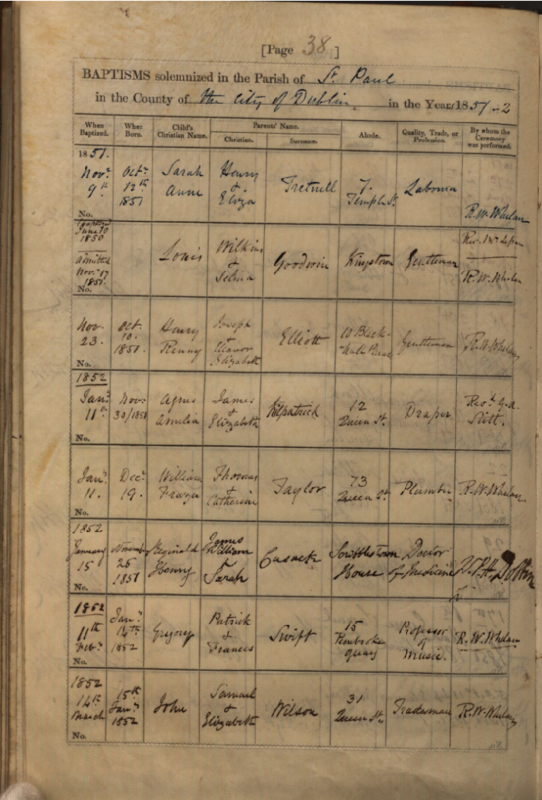 The documents on the next page has James Kilpatrick’s signature upon it, and when you see this signature it is very similar to that on his marriage record. Fourth column, second sheet on next page. 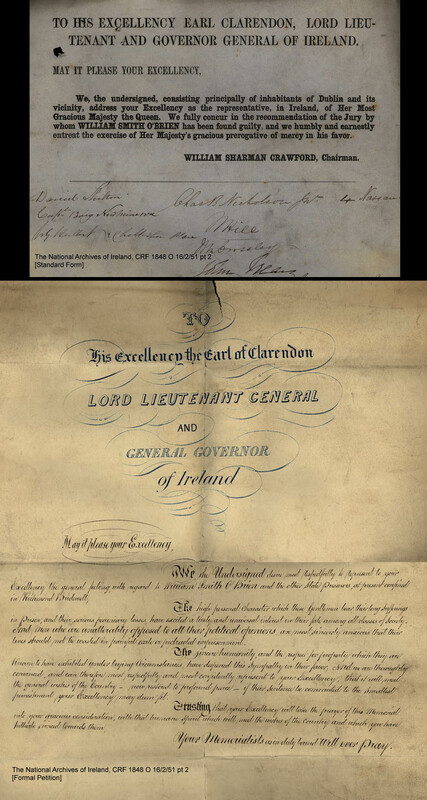 Created in 1841 at the instigation of the Duke of Leinster, Daniel O’ Connell and others, this remarkable document marks the occasion of Lord Morpeth departing from his political office in Ireland. 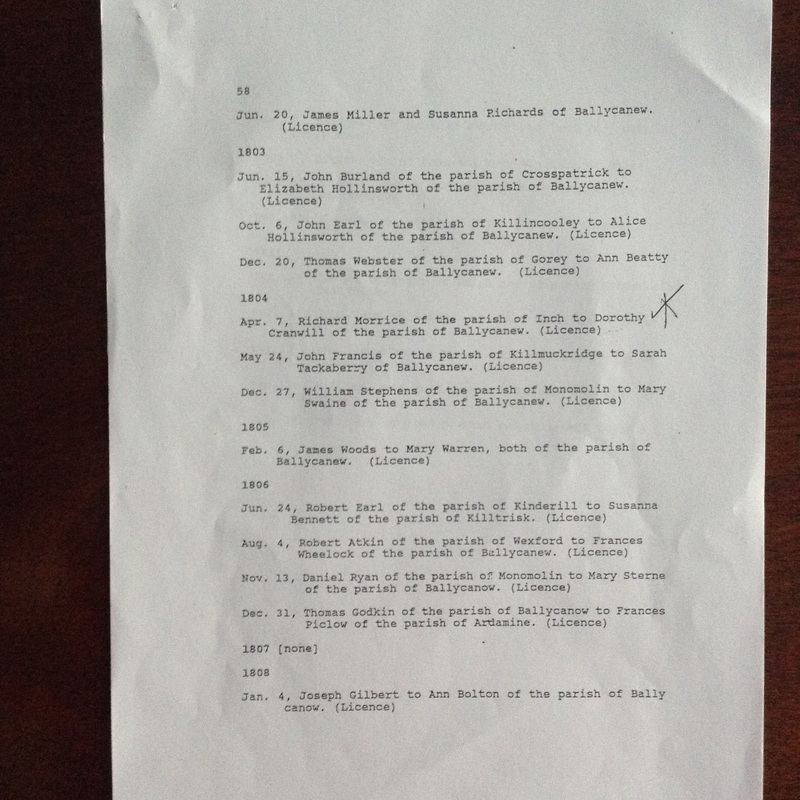 James Kilpatrick signed his name to this document which acts like a census for Ireland. 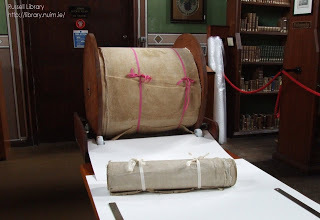 The Morpeth Testimonial Roll, wrapped around a gigantic bobbin, measures 412 metres in length and contains around 250,000 signatures gathered from across the whole of Ireland. Since 2009 it has been lodged in the Russell Library, Castle Howard, Yorkshire. 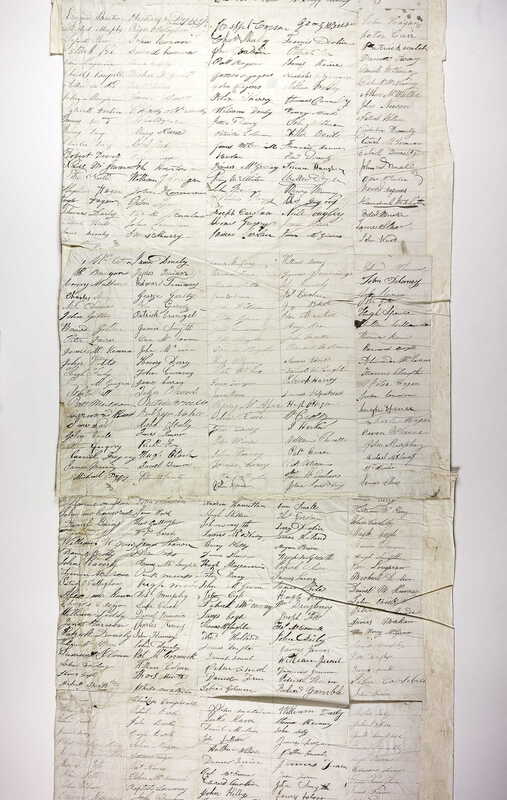 The roll consists of 652 sheets of paper which were either signed in Dublin or sent out to the counties of Ireland for signing, and returned to Dublin for assembly. This remarkable feat was undertaken in the space of a month; from collecting the signatures to compiling the roll to constructing the wooden bobbin and chest. Some of the sheets still bear their postage stamps and franks, which are secondary additions of great historical importance, as printed stamps were only introduced in 1840. 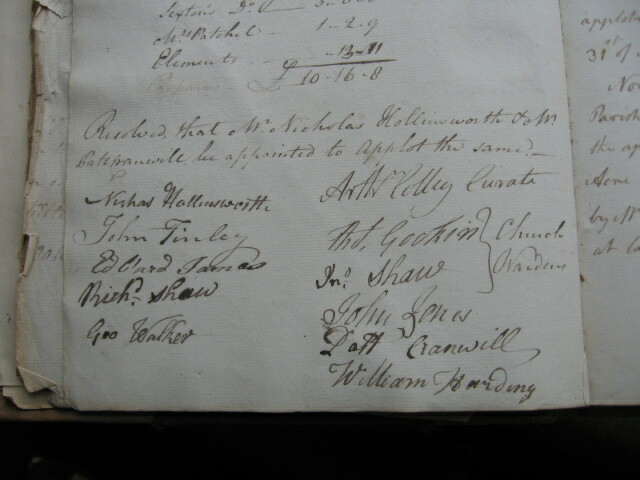 James Kilpatrick signature also appears is on the Earl of Clarendon plea document, see the image on the next page, lodged at the NAI in Dublin, for the mercy of William Smith O’Brien. 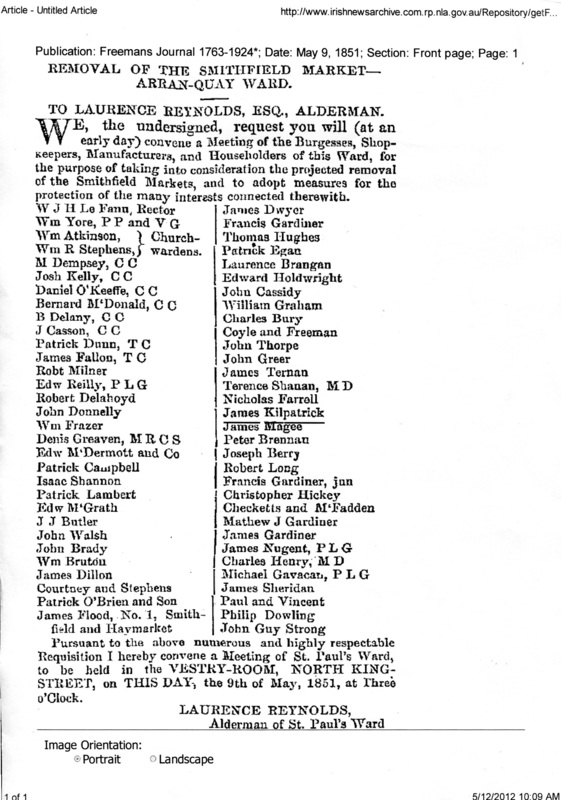 The Petition gathered in 1848 records the names, addresses, occupations and political loyalties of over 80,000 people from all over Ireland and parts of England. Over half of the names collected came from Dublin. It is one of the first mass political petition movements, which aimed to save the life of this rebel leader, after his conviction for high treason and sentence of death. It was acknowledged that O’Brien was committed to Irish independence and he headed up an uprising in Ballingary, County Tipperary. 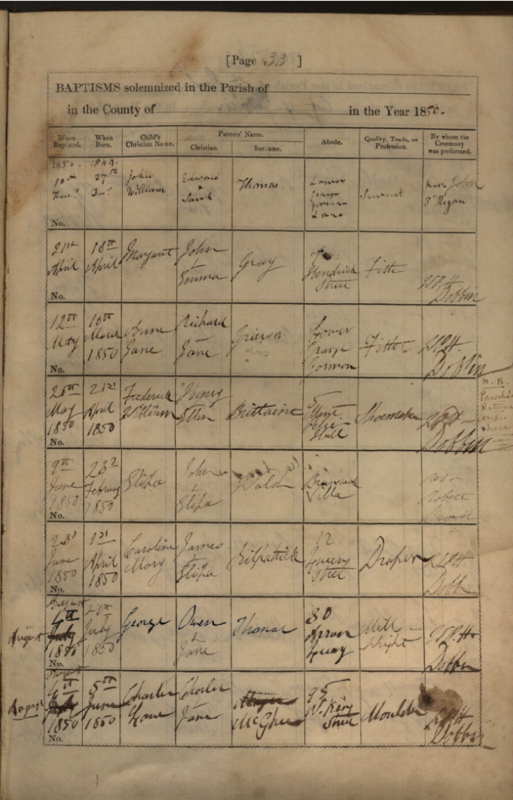 This was an Ireland wide petition, and James’ signature appears in the Dublin Petition, Part 1, where he also gave his address as Queen Street, Dublin, giving me absolutely no doubt that this was my great great grandfather. 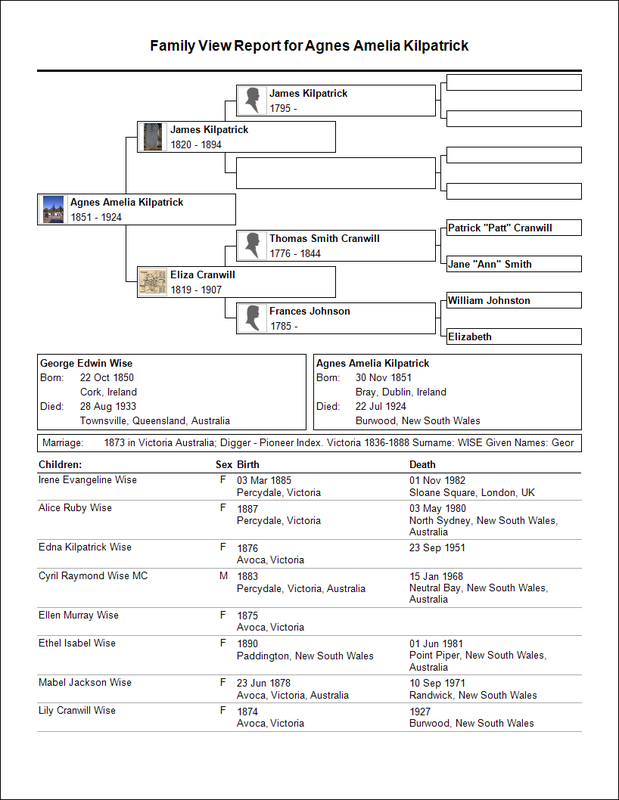 I found this document on Find My Past website which is available for free at the NSW State Library. The petition was successful and O’Brien’s sentence was commuted to transportation to Van Diemen’s Land and was released in 1854 with the understanding that he would be unable to return to Ireland. He spent two years living in Brussels before he was finally pardoned and was allowed to return to Ireland but never returned to his rebellious ways. 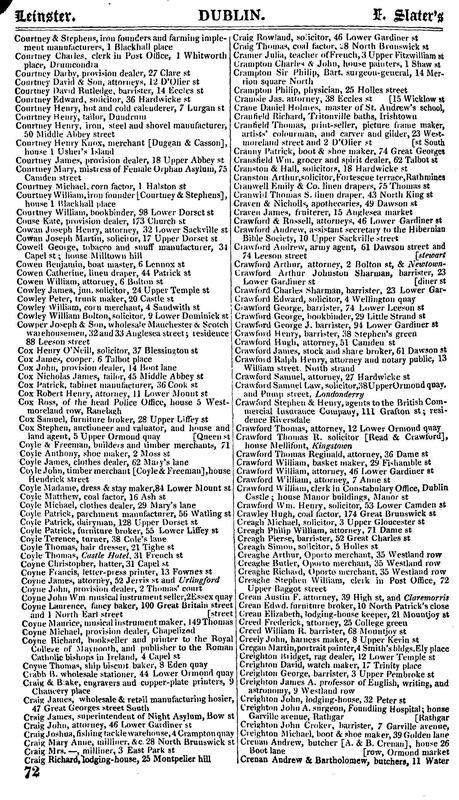 Emily “Amelia” Cranwill, sister to Eliza Kilpatrick nee Cranwill, married William J Holland on 3 July 1846, the same year as this listing of Slaters Directory (previous page), which was presumably printed before her marriage. Holland’s occupation was listed as gentleman, and his father’s, a cooper. They were obviously all in the merchant trades of Dublin, and led a comfortable upper middle class, and seemingly prosperous existence. 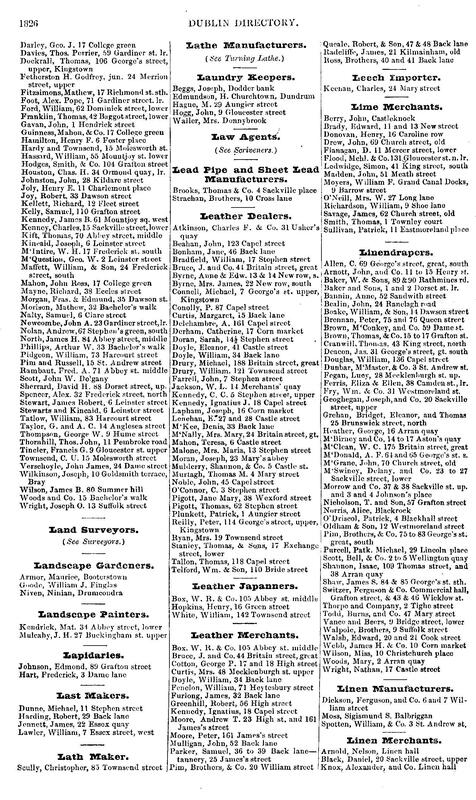 The directory shows a listing for Thomas S Cranwill, of 43 North King Street and an Emily Cranwell at 75 Thomas Street, both linen drapers. These entries are without doubt Eliza’s brother Thomas Smith Cranwill Jnr. who carried the same name as his father, and her sister Emily Cranwill. Although I don’t have any death records for their father, I have collected and shown below his two probate documents, one for 1844 and one for 1861, both show the probate was not resolved until 1861. Eliza’a brother died in 1890 as I have collected his death record, which also gives his year of birth as 1815, tying in with Eliza generationally. It is unusual to have two probate documents, however, their father could have made a complicated will, and there may have been a split in the family finances after 1844. A trip to Dublin to visit the National Archives of Ireland may shed some light on these documents. 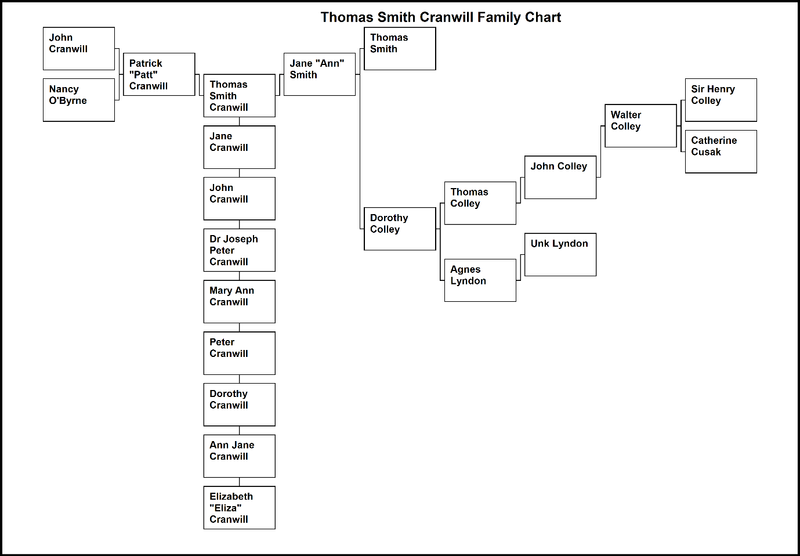 Thomas Smith Cranwill was born in 1776, the third son of Patrick “Patt” Cranwill and Jane “Ann” Smith. Irish naming traditions were followed by the Cranwills, and he was given his maternal grandfather’s full name, Thomas Smith. He came from a large family including three brothers, Peter abt. 1772, John abt. 1775 and Dr Joseph Peter Cranwill abt. 1779, and five sisters, Jane abt. 1769, Dorothy abt. 1780, Mary Ann b 1782, Elizabeth “Eliza” abt. 1783 and Ann Jane abt. 1790. In all probability Patrick and Jane had more children in the intervening years that did not survive to adulthood. Jane Cranwill, the eldest daughter married the Reverend Fossey Tackaberry, a Methodist Preacher from Wexford, whose life is still celebrated today with meetings and gatherings to discuss his life’s work and the books that have been written about him. Thomas Smith Cranwill was surrounded by highbrow influences, it was written in a letter by his great granddaughter Mia, that he gave his occupation as a literary dilettante in Dublin circles, his father Patt was involved in the Church of St Mogues, at Ballycanew in Wexford as a Pew Holder and Church Warden, and with the connection to the preacher Fossey Tackaberry whose ancestors all worshipped at St Mogues, Ballycanew, and are listed in the church’s register, it can be seen that Thomas Smith Cranwill was surrounded by men of great influence and leadership. 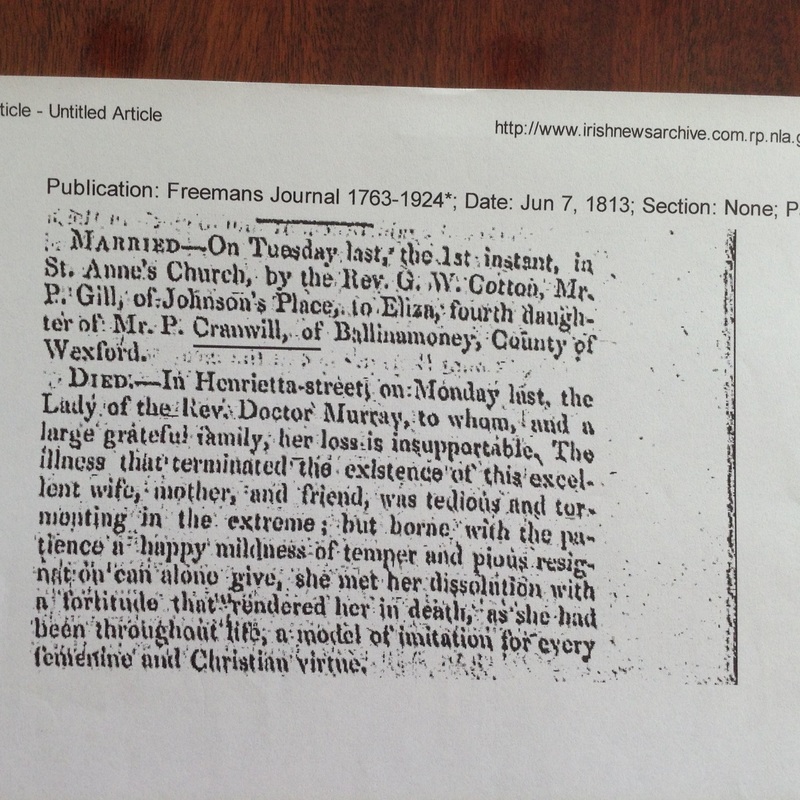 Thomas Smith Cranwill married Frances Johnson on 24 June 1801 at St Michael’s Church, High Street, Dublin. The church was demolished in the late 1800’s to make way for architect George Edmund Smith, to build the Christ Church Cathedral, which still stands today in Dublin. Thomas and Frances’ marriage licence is listed below. 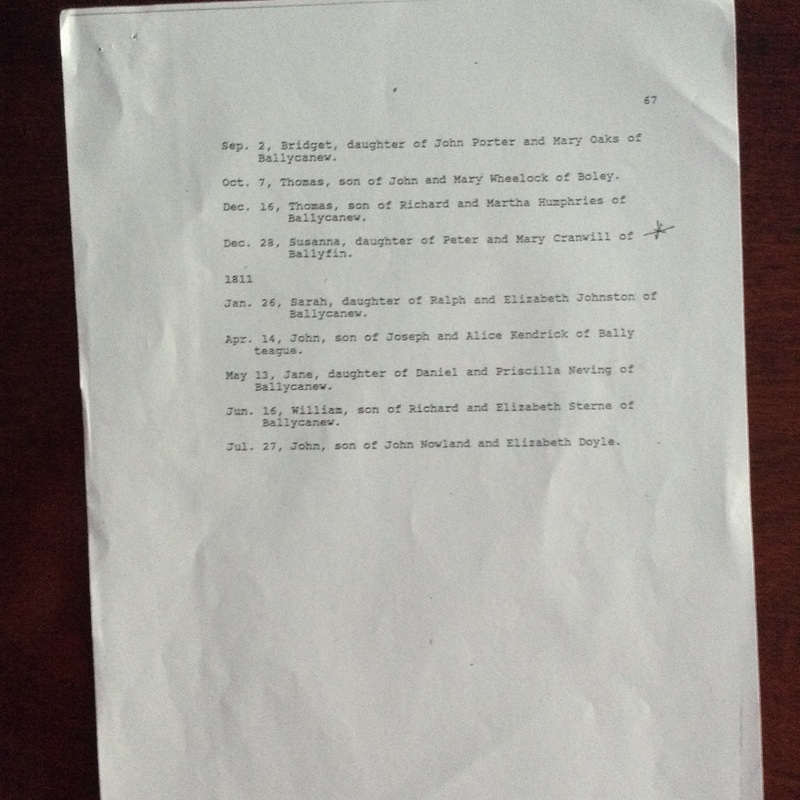 It would open another chapter of our Dublin family history if I could find Frances Johnson’s mother’s name. Eliza Cranwill named her eldest daughter Elizabeth Frances, following Irish naming traditions, whereby the eldest daughter is named in honour of her maternal grandmother. The name Elizabeth, in this case was possibly her great grandmother’s name. I believe Mabel Wise was named in honour of her grandmother, Frances Johnson, however in outback Percydale, Victoria, Australia, she was erroneous christened as Mabel Jackson Wise. 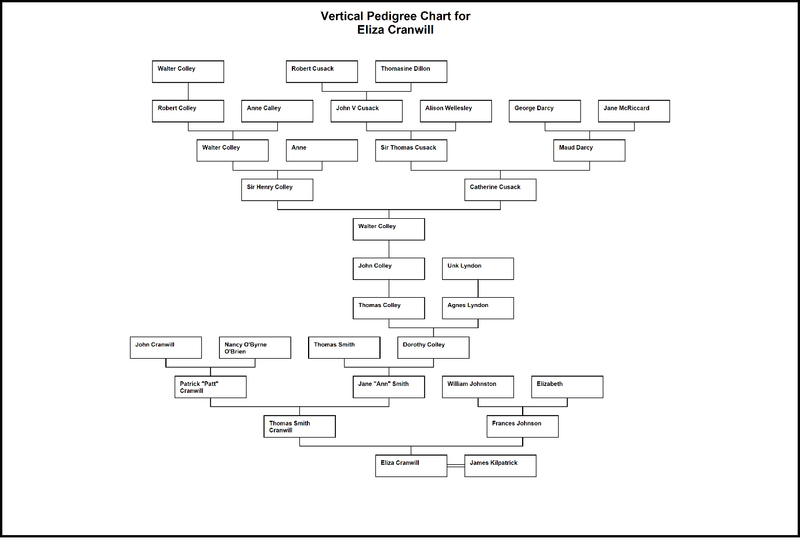 The chart above is a vertical pedigree chart for Eliza Cranwill. It is important to work from the bottom and move upwards with each generation. 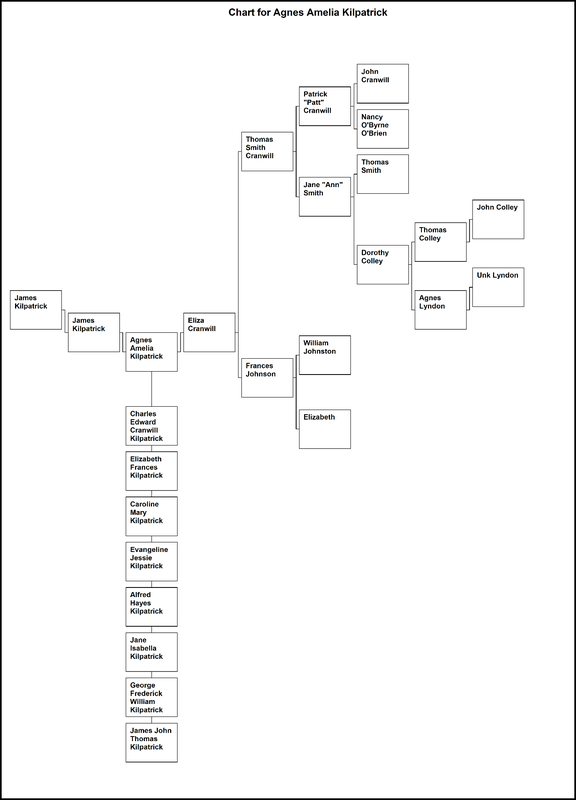 It is possibly the best chart to show many generations on one page, Eliza being my great great grandmother, this chart can take us back ten more generations in our tree from there. Two other interesting connections occurred by way of messages on ancestry.com from other Cranwill family researchers. 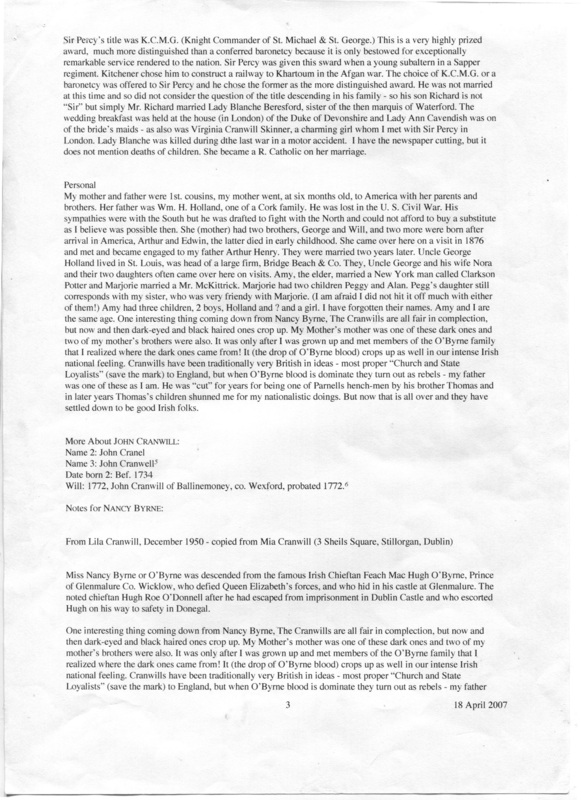 The first was a message link on ancestry.com to Mary Ann Cranwill, Patrick and Ann Cranwill’s third daughter who married William George Eades. Margaret Greenwood of Melbourne and I corresponded on the Cranwills immediately. Margaret explained that William and Mary Ann Eades son, John Cranwill Eades, and his family migrated to Melbourne. John Cranwill Eades would have been a first cousin to Eliza Cranwill who married James Kilpatrick. 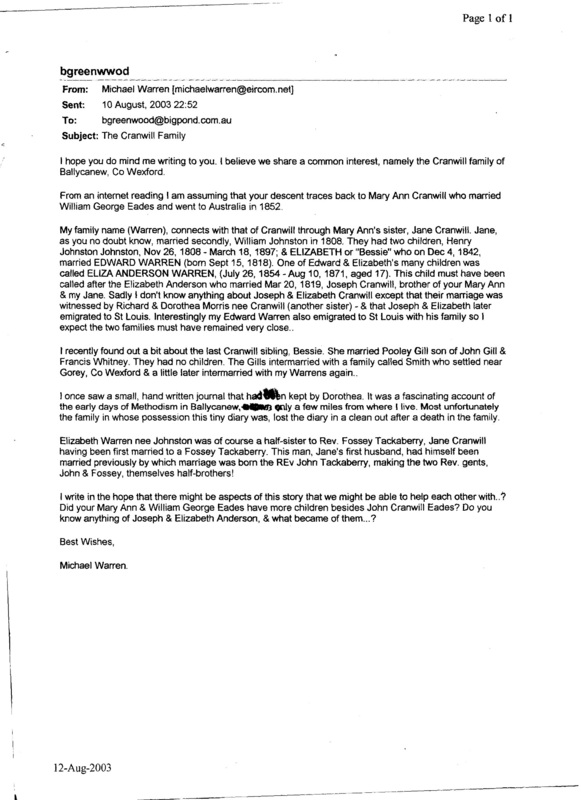 Perhaps in the early stages when the Kilpatricks were living in Melbourne they were in contact with John Cranwill Eades? It was thrilling to have a connection to Margaret Greenwood, who was as excited as I was that we had found a fellow Cranwill researcher here in Australia. Margaret sent me quite a lot of information and photos, and her research on the possibility that the Cranwills had hailed from England, before settling in Dublin and Ballycanew. She showed me great kindness during my early stages of research which was limited to the fact that I only found out about the Cranwills recently. 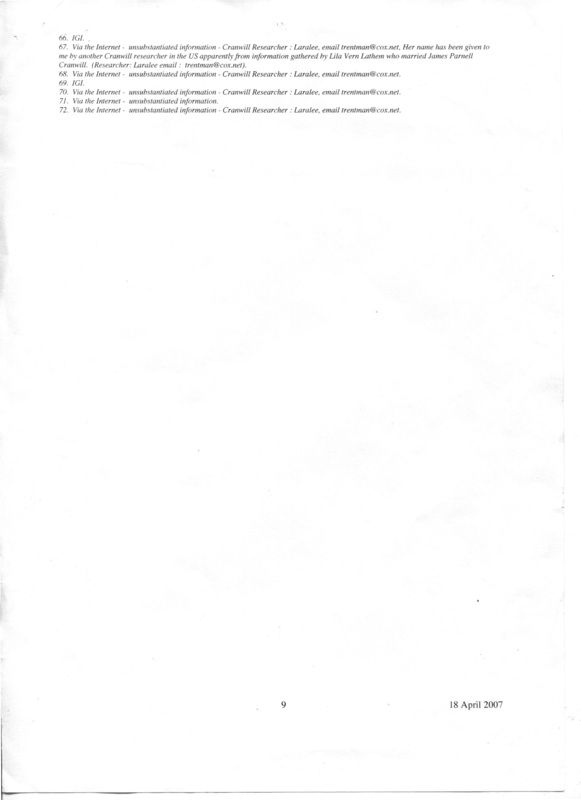 This next document came from Margaret Greenwood, as part of the package of information she kindly posted to me. Margaret has worked tirelessly as a researcher and her contacts and information have been vital to my family tree. To her credit, as a true family researcher, she knows the value of sharing documents, as this document may lead to unearthing further information over time. 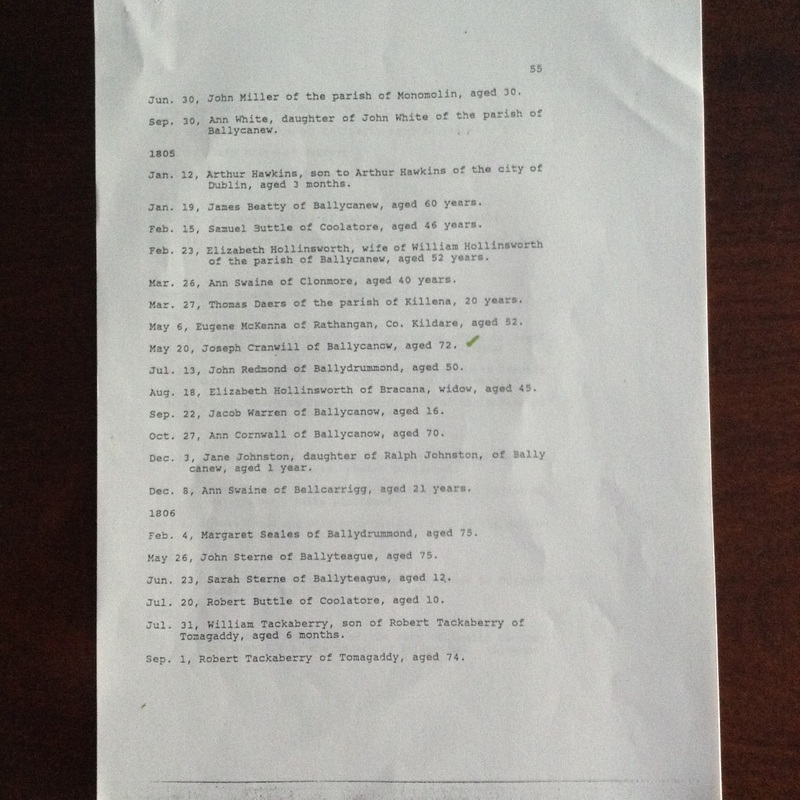 For the first time this “assignment of land” document, which I believe is from the Public Records Office of Ireland, reveals Frances Johnson’s father as William Johnston (sic). Patrick and Thomas Cranwill’s name is spelt Cranwell. I am not too bothered with this, as spelling mistakes are common, particularly in regard to scribes, be it the parish church, the census collector, or in this case the city clerk. 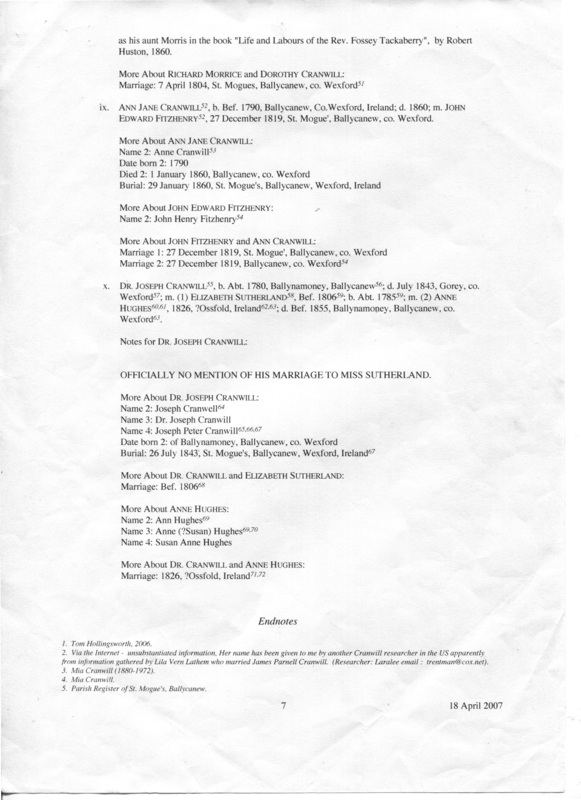 The important thing is that without a doubt this document is regarding our ancestors, and it is a gem and today it would be described as a “pre-nup”. 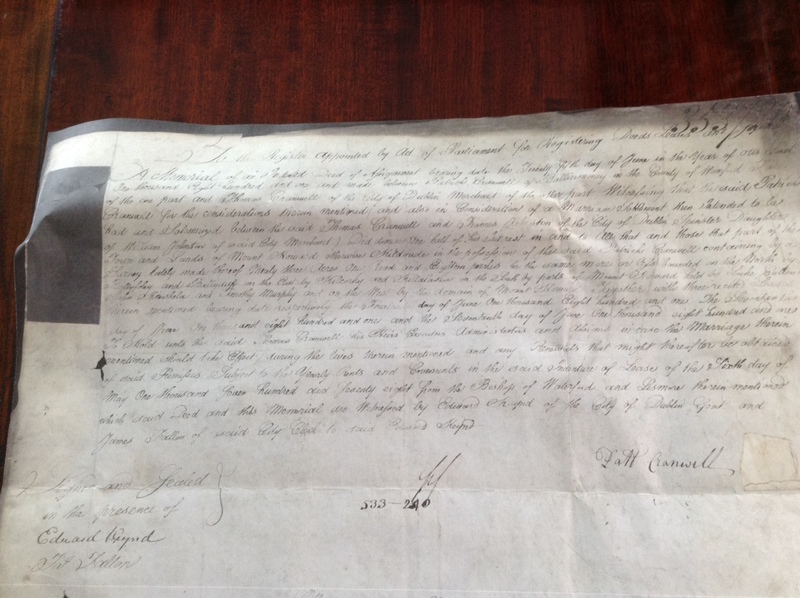 This would appear to be a deed of assignment of a lease that had been entered into on the 6 May 1778 from the Bishop of Waterford and Lismore, which had passed into the name of Patrick Cranwill of Ballinmoney, Co Wesford, farmer. 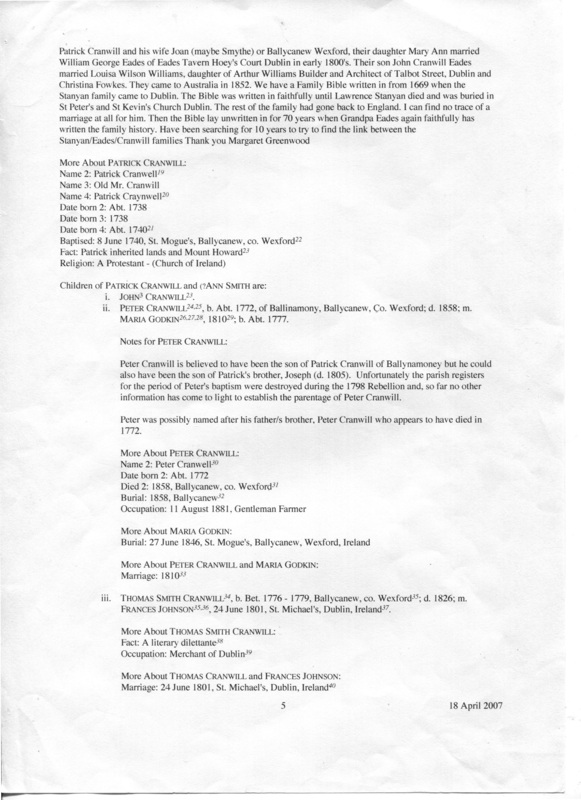 Further, as at 25 June 1801 Patrick Cranwill for the consideration mentioned in the deed and the intended marriage between Thomas Cranwill, Merchant of Dublin, and Frances Johnston the said Patrick Cranwill transferred one half of his interest, and listing the father of the bride, William Johnston, Merchant of Dublin, that his daughter was marrying someone of substance. The original document I purchased in Dublin from the Registry of Deeds Office in August 2016 during my trip to Ireland. The lands of Ballinamony, near Ballycanew, was the home of the Cranwills, and from this map it seems unchanged in 200 years. Amazingly the referenced place names are also unchanged. Whilst I am incredibly grateful for this document I lament that so much more information could have been provided by these men, a simple address, or a middle name would have helped to identify which William Johnston/Johnson is involved, as a search of Merchants bring up several William Johnsons Merchants of Dublin, that it would be unwise to speculate which is our William. 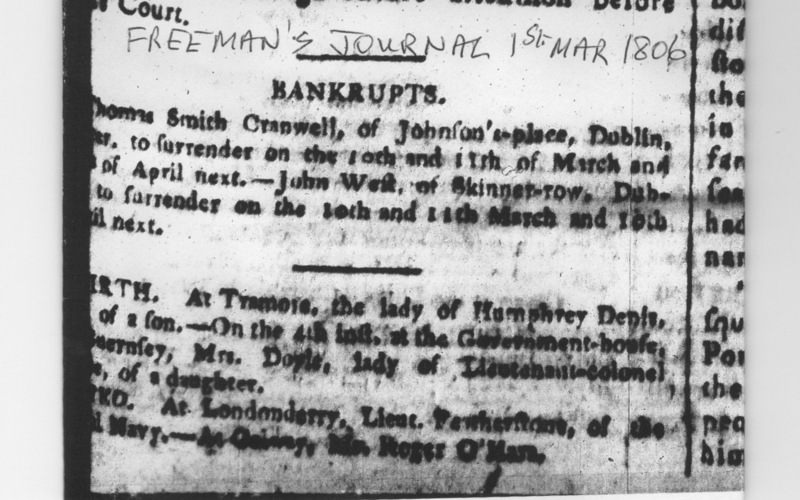 It was very worrying to see this notice from Freeman’s Journal, showing that Thomas Smith Cranwill had found himself in financial difficulties, bankruptcy was treated very seriously in the criminal courts and often result in imprisonment, unless there was some way to pay off the debt by the due date. 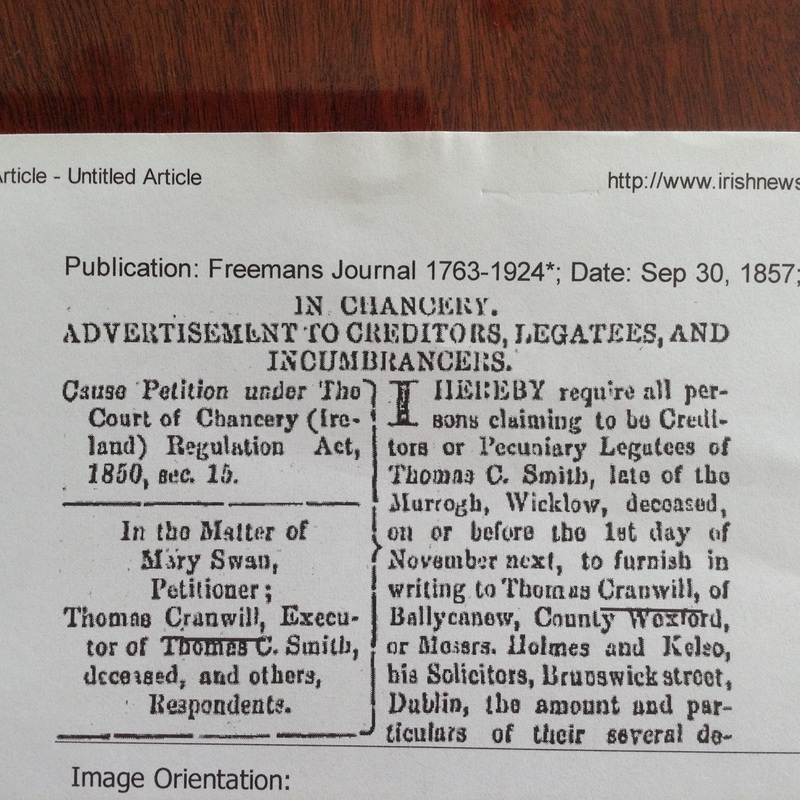 I had collected other Cranwill Land Deeds for Thomas Smith Cranwill from the Dublin Register of Deeds and could see that Thomas was probably selling off land to pay his debts. However, knowing that the Cranwill grocery business survived and was handed down to Thomas Smith Cranwill’s son Thomas Smith Cranwill Junior, it would seem that Thomas Smith Cranwill Snr escaped the wrath of the bankruptcy laws and his business survived and thrived for another generation. 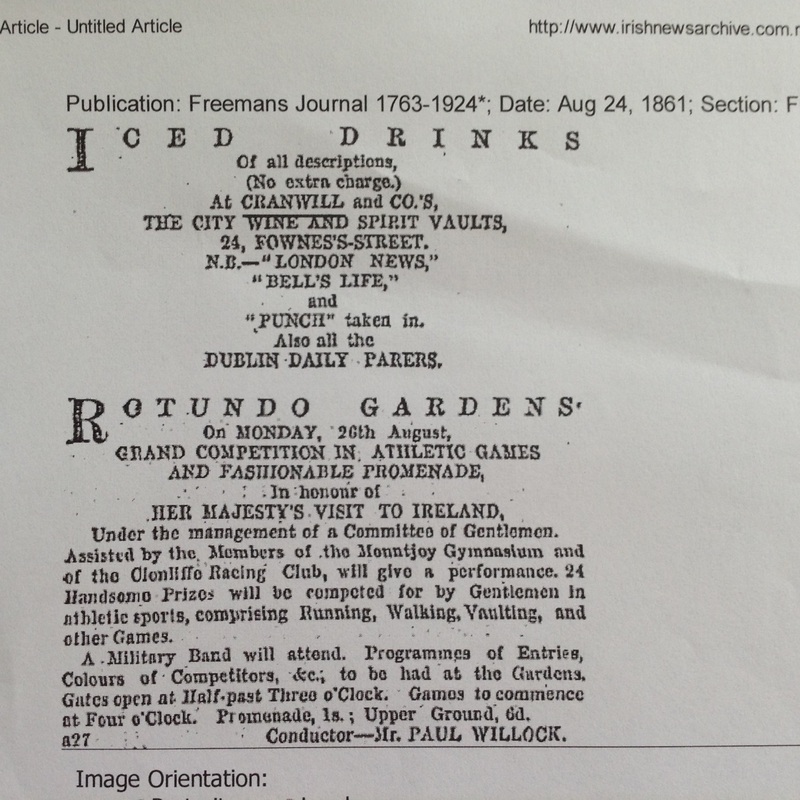 This next document is from a Dublin Directory, listing a William Johnson, Flaxdresser of North King Street, Dublin, and a William Johnston, grocer of Patrick Street, Dublin, both listings could possibly be Frances Cranwill’s family, her father William Johnson and possibly her brother, also named William. 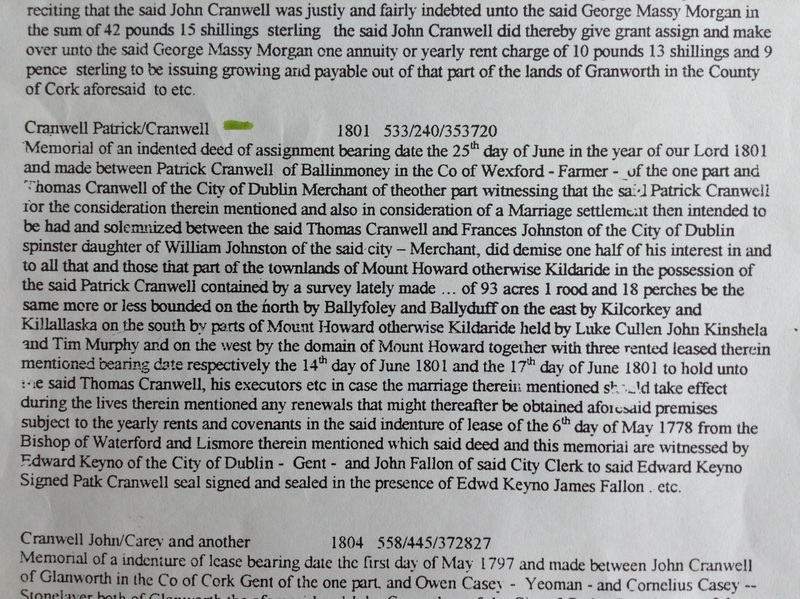 I found an interesting reference to Eliza Cranwill, fourth daughter of Mr P Cranwill of Ballinamoney, Wexford, from an old Irish newspaper which gave much information, including the fact that Eliza’s family was indeed a large one and showing that the name Eliza was very much a Cranwill family name. This Patt is obviously Patrick Cranwill and Eliza Cranwill would have been an aunt to Eliza Kilpatrick. Again the interesting listing of Johnson’s Place, could it be that this was Frances Johnson’s family address in Dublin, so named due to their long association with the area? In 1800 Dublin was the capital of Ireland, with an independent Anglican/Irish Parliament, although still dominated by the English peerage system; however many of these Peers and MP’s had been born in Ireland. It was during this period that many of the great Georgian buildings and street scape schemes of Dublin were built. By the late 18th century, these Irish Anglicans came to regard Ireland as their native country. This ‘Patriot Parliament’ successfully agitated at Westminster for increased autonomy and better terms of trade with Great Britain and the Colonies, there were also penal reforms which were less severe than those imposed by the Westminster system. Under the influence of the American and French revolutions, some Irish radicals went a step further and formed the United Irishmen, a group wanting to create an independent, non-sectarian and democratic republic. United Irish leaders in Dublin included an even more radical element with Napper Tandy, Oliver Bond, Edward Fitzgerald and Wolfe Tone (leader) who planned to take Dublin in a street rising in 1798, however they were arrested and the city occupied by a large British military presence shortly before the rebels could assemble their forces. There was some local fighting on the city’s outskirts at Rathfarnham, but the city remained secure. The ramifications of this ‘rebellion’ shocked Dubliners and Westminster alike, and in response in 1801, the Irish Act of Union sought to merge the Kingdom of Ireland with that of English rule under what became known as the United Kingdom of Great Britain and Ireland. The Irish Parliament then voted itself out of existence and Dublin lost its political status as the capital of Ireland. Though the city’s population continued to grow, it suffered financially from the loss of income, which was bought to Dublin during Parliamentary Sessions. During these Sessions, the Peers and MPs would have bought their extended families, guests and thousands of servants to the city. The loss of the Parliament meant the social season of the Vice Regal court in Dublin effectively ended. The prestige of Dublin and its prosperity waned. Within a few years many of the finest mansions, including the Houses of Leinster, Powerscourt and Aldborough were put up for sale by their Anglican/Irish Peers. Many of the once elegant Georgian neighbourhoods of Dublin rapidly became slums. In 1829 the wealthier Irish Catholics recovered full citizenship of the United Kingdom. This was partly as a result of agitation by Daniel O’Connell, who organised mass rallies for Catholic emancipation. Unlike Belfast in the north, Dublin did not feel the full effects of the Industrial Revolution, and as a result unemployment was high. Efforts were made to stem this problem when a radical new tramway system was initiated by a private company, the Dublin United Tramway Company, which employed the local trades and labourers for the job. Guinness brewery, Jameson’s Distillery and Jacob’s biscuit factory also help to provide for a more stable employment. However, the horrors of the potato famine in rural surrounds in the mid 1840’s bought to Dublin an increase in crime, when these displaced and starving farming communities crowded into the city Dublin stalled in these uncertain and unstable times. Animosity between Catholics and COI increased, as did incidents of outrage including threats, bashings, kidnappings and fire bombings. 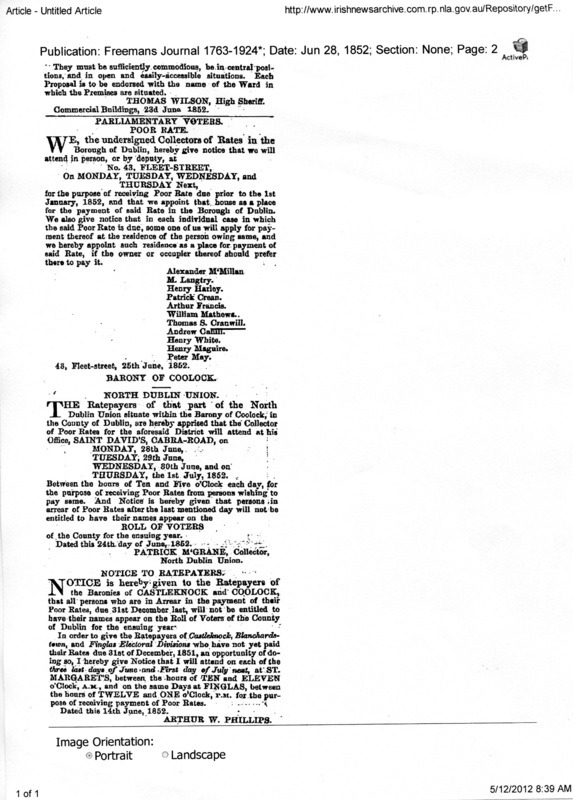 Aggressive advertising encouraged millions of Irish to migrate to America, Canada, Australia and New Zealand, to start a new life with new opportunities for land ownership and prosperity; this coupled with the discovery of gold in California, and in country Victoria and NSW in Australia, were probably just some of the reasons that these migration policies were so successful. Other poor souls were convicted under stringent British laws, many for minor theft, and transported to Australia by the thousands; shipload after shipload of convicts left Ireland for Australia, never to be heard of again in their homeland. In the space of nearly sixty years the population of Ireland halved, from eight million in about 1845 to four million in 1901, when the Irish census was taken. Families were torn apart by this migration, and in the two hundred years since this massive relocation of peoples leaving Ireland, it is a fact that many Australians today still have no idea where they came from, or who their ancestors were. Our Protestant Irish family, the Kilpatricks left Dublin in the early 1850’s bound for Victoria, Australia as unassisted migrants, leaving their extended families and a land that had been their home for centuries. Their reasons were probably financial, but it cannot be discounted that there was always the underlying threat of a Catholic rebellion against the English rule, which could have placed their lives in Dublin in danger. 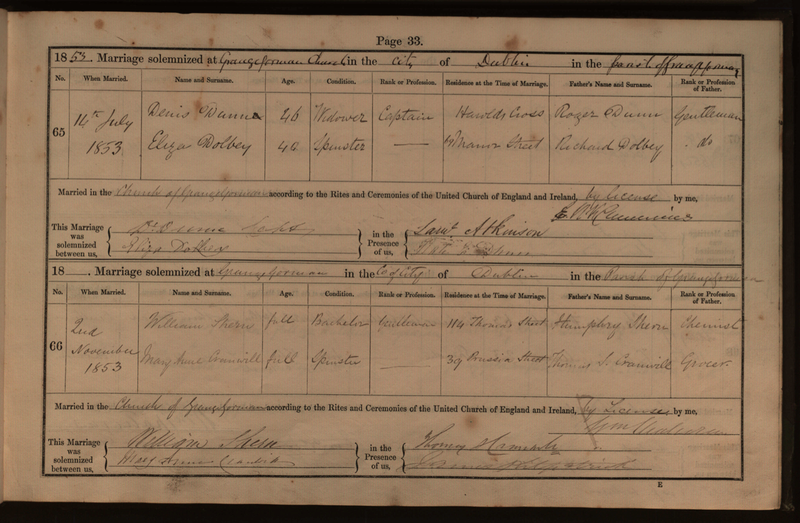 Whilst records are the only way to illustration our ancestors’ life in Dublin, uncovering some of the records of the extended family of Eliza Cranwill have also helped me to get a clearer picture of their everyday lifestyle. The marriage of Eliza, the educated daughter of a grocery merchant to James Kilpatrick, a linen draper, was an appropriate union of upper middle class people, which was supported by her family. Eliza’s family was a large one, with five sisters and three brothers. It is evident that Thomas Smith Cranwill Jnr. and his sister Emily took over a successful business from their father because of the listings of his occupation on various marriage records for his daughters. The grocery business would seem to have been a thriving concern and small advertisements appeared regularly in the local newspapers. 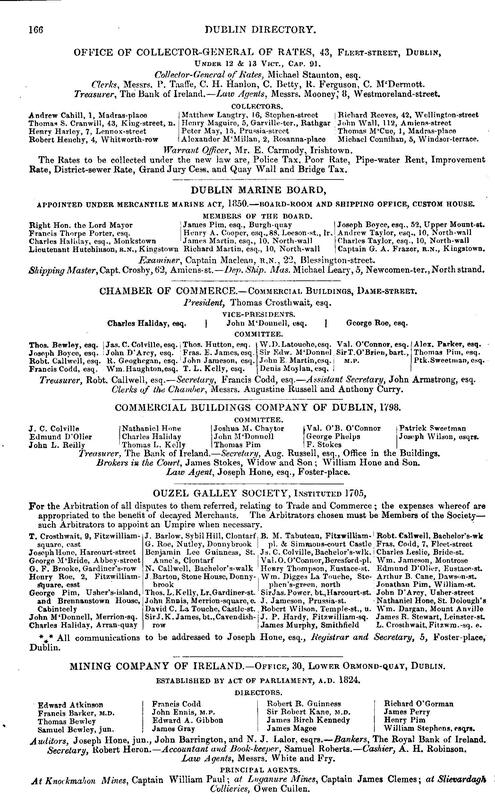 On the next page is a listing, from page 1826 of the Dublin Directory, in the year 1868, for Thomas Cranwill, also trading as a linen draper. 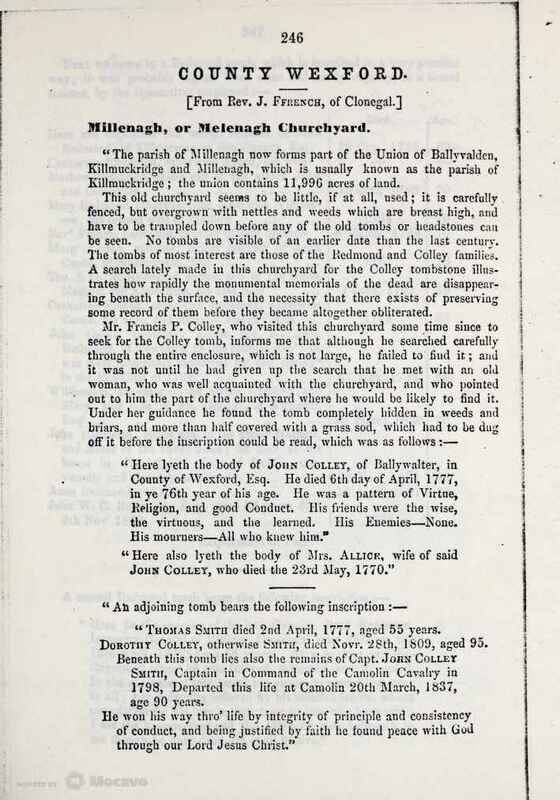 The next few pages contain directory entries, probate records and newspaper articles regarding Thomas Smith Cranwill, the brother of Eliza Kilpatrick, nee Cranwill. It should be noted that he is active in both Dublin and in Ballycanew areas. The probate record also confirms his son named Arthur Henry Cranwill. Cranwill being such an unusual name has been such a gift to me in the research of this family and I have been able to place many of Eliza Cranwill extended family into the tree with the confidence that each time I found a Cranwill record from Dublin, it was always a member of the family, and it was just a matter of working out the branches. This entry shows that the Cranwills as well as the Kilpatricks were linen drapers. The other interesting family connection came from Tom Hollingsworth, and his website Holly Gardens. A simple Google of the name Cranwill brings up Tom’s website which has an enormous amount of interest on it for our family. Tom’s site concentrates naturally enough, on his own family line, but also concentrates on his ancestors, and for this, I have had a most interesting time going through his tree and its sources, because his ancestors on the Cranwill line, become our shared ancestors. Jane Cranwill’s second marriage to William Johnston is his line. Jane had firstly married Fossey Tackaberry. She was the elder daughter of Patt Cranwill and a sister to Thomas Smith Cranwill, the father of Eliza. Tom visited Balleycanew in 2005 and 2007, where he had full access to St Mogue’s Church vestry records and was able to photograph some. He also told me that he met a woman named Cranwill who lived opposite St Mogues, who was very kind and showed him around her property. Margaret Greenwood had earlier included ten pages from the Vestry Book where the name Cranwill was mentioned in her letter package to me. These pages I have added to the end of this chapter, and a huge thanks must go to Margaret for her help. I didn’t realise at the time I received them, that they were such a valuable document for our Cranwill family. 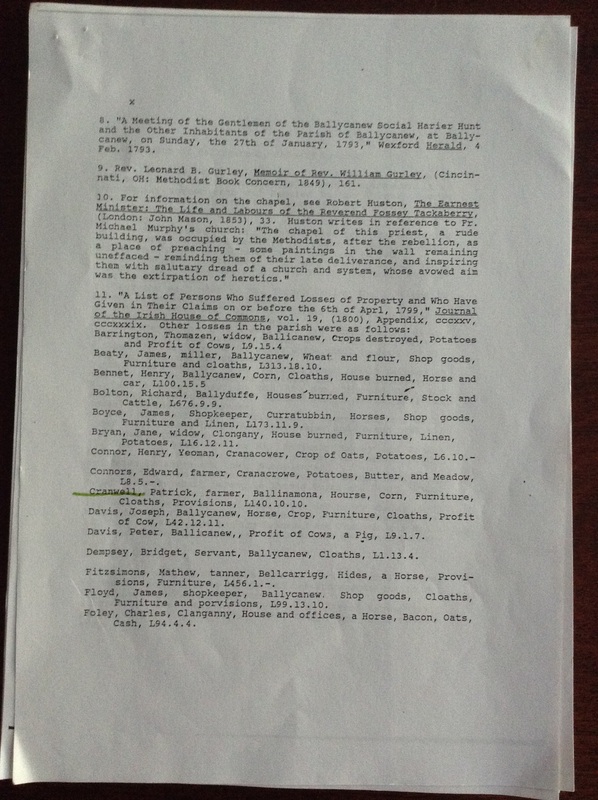 As my research intensified in Ireland I was continually finding other historians and family researchers who were placing records and family histories and stories regarding the Cranwills online, and all of these researchers referred to Ballycanew in Wexford. 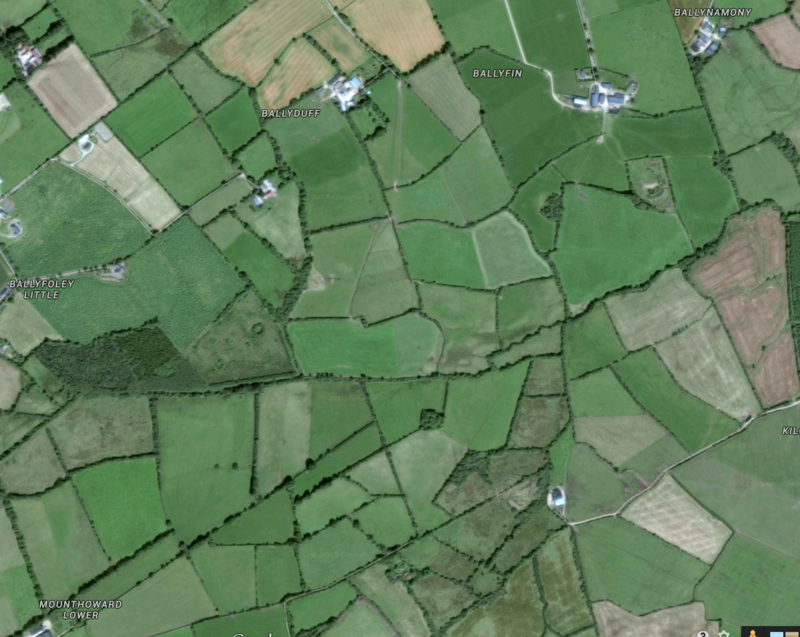 This was probably where the family for generations had been landowners and lease holders, and all would have had connections to St Mogue’s Church, a Church of England and Ireland faith. Some branches of the family had obviously moved to Dublin, but originally I suspect that the family were all farmers, living near to Ballycanew, and their Church was the major connection with their society. The photographs above came from a website called Holly Gardens authored by Tom Hollingsworth who has done a good deal of work on the Cranwills, Smiths and Colleys. 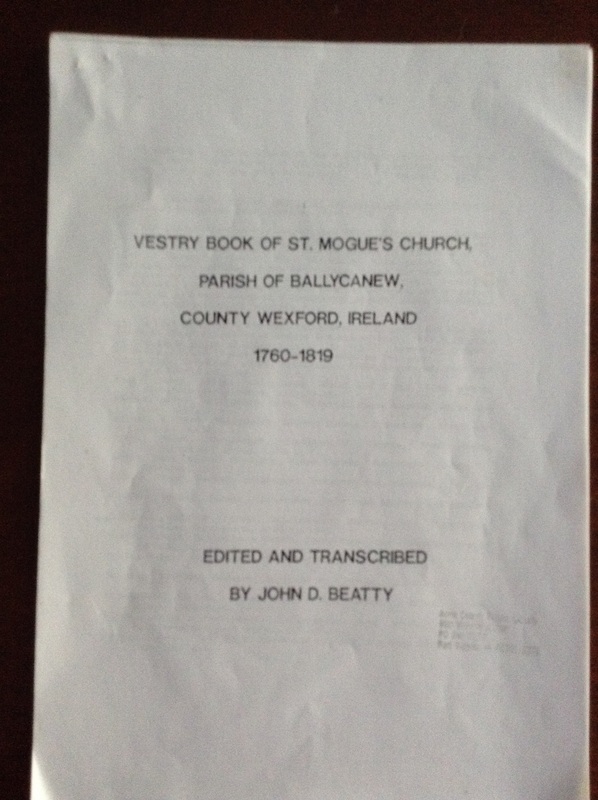 He refers often in his online history to The St Mogue’s Vestry Book, and a transcription of this book is able to be downloaded online as a PDF document for the researcher. Patt Cranwill’s name and signature appears several times in this book. The first photograph on the previous page comes from an original page of the vestry book. Tom Hollingsworth’s had illustrated this page in the book, because his ancestor Nicholas Hollingsworth appears. 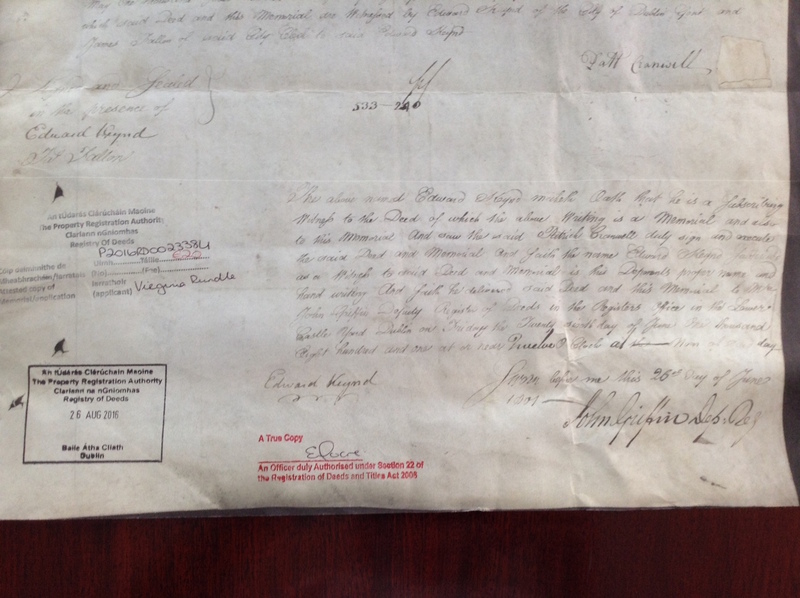 I was just lucky to notice that my ancestor, Patt Cranwill had signed his name to this document as well. I cannot tell you how amazed I was to see his signature, especially when you consider that Patt Cranwill died in 1828. I am most grateful for this important information from Tom Hollingsworth. 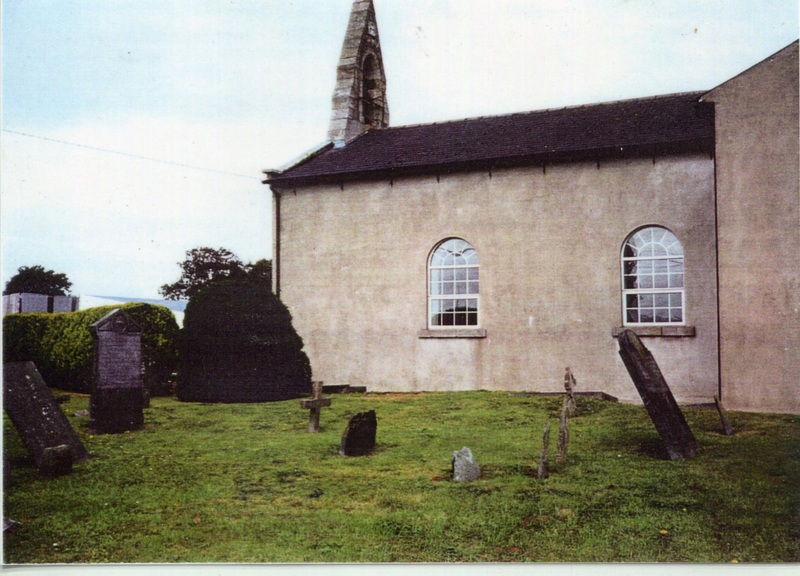 Among the documents and photos supplied to me by Margaret Greenwood was the following photo, taken of St Mogues Church and graveyard, where many of our ancestors are apparently buried. 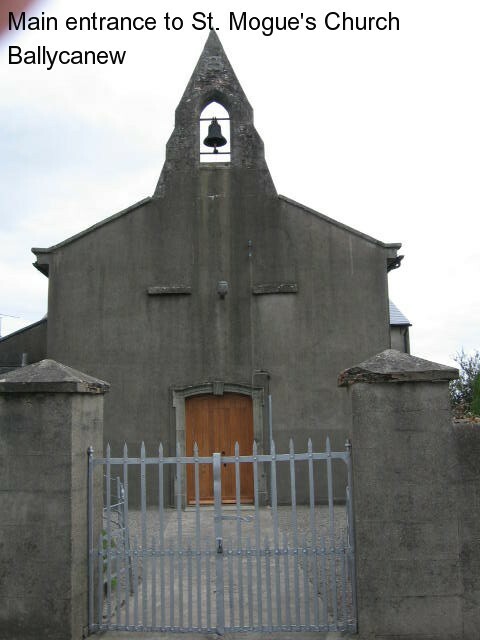 Image of St Mogue’s Church, Ballycanew, Wexford, courtesy of Margaret Greenwood. 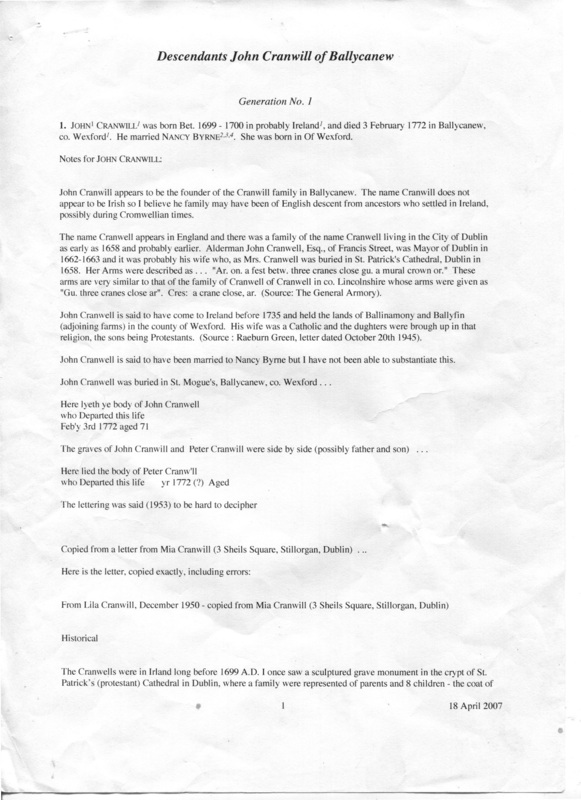 Margaret Greenwood also gave me a copy of her Descendants of John Cranwill of Ballycanew document, dated 18 April 2007, and it can be seen that Margaret has been researching the Cranwills for quite some time, while I only started in 2011. It has been my greatest pleasure to collaborate with Margaret, and we are hoping to finally meet in August this year when she visits Sydney. Who Departed this life ? 1772 Aged ? Part of my trip to Ireland in 2016 will be to try and find this grave of my 5 X Great Grandfather, John Cranwill. 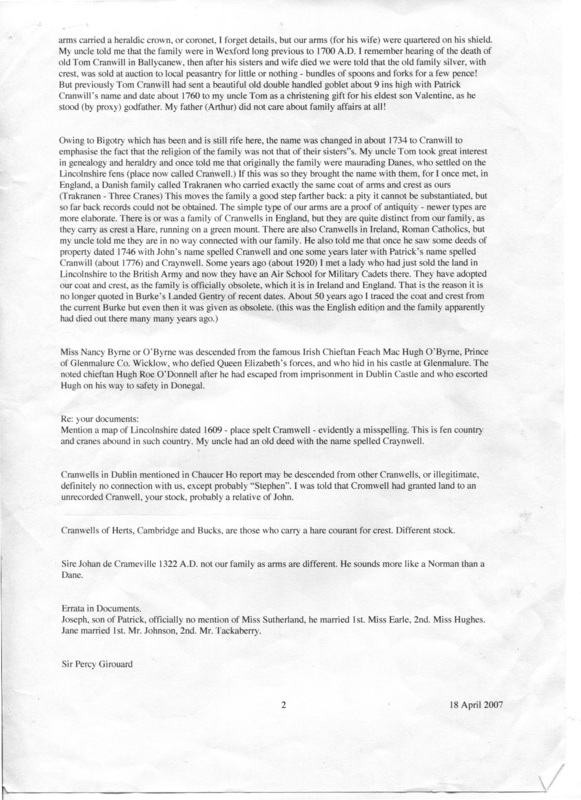 Margaret also has a copy of a letter dated Dec 1950 from Mia Cranwell, 3 Shields Square, Stillorgan, Dublin regarding the Cranwill family stories, myths and legends. Mia being a granddaughter of Thomas Smith Cranwill, Eliza Kilpatrick’s brother. Margaret’s document on The Descendants of John Cranwill has been attached to the end of this chapter and contains some fascinating stories and facts on the Cranwills. Not all of it can be established at this stage. but over time more information I am sure is going to come forward to support and extend her vital research. 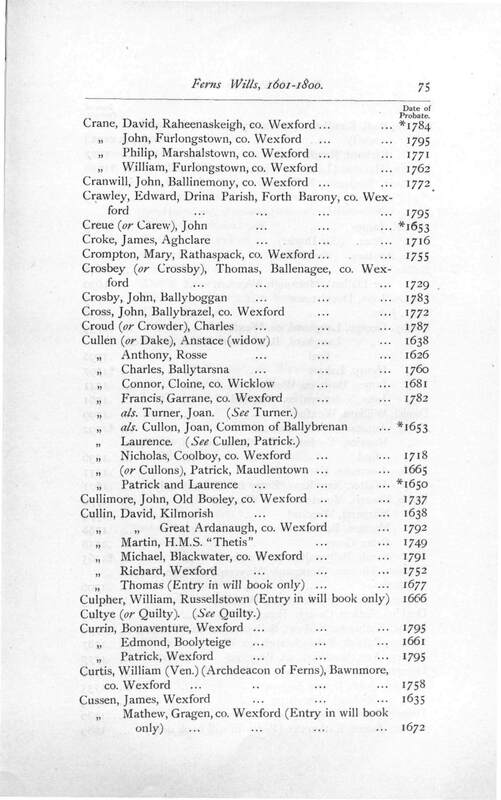 The next page shows a directory entry for a Will document, registered in the historic town of Ferns, Wexford, for John Cranwill of Ballinemony, 1772, father of Patt. It is of great historical significance as it takes the family back yet another generation and confirms Patts father as living at Ballinemony, but gives the date of his death which then coincides with the date on his headstone listed above. For your info and hope you follow where I am coming from. In looking again at the 1760 allocation of pews, I can’t tell that any of them are assigned a specific number. The vestry minutes show a list of people in pews, and the list is numbered 1 to 12 with 13 blank on one side, and then 1 to 11 on the other side. James Bulger and John Cranwell were assigned under #12 in the first sequence. They were “back-benchers,” as it were. The people with less money were crammed into the back rows while the richer sorts with “Mr” or “Esq” by their names were closer to the front. The exception is that the seats in one of the transoms were all of the poorer sorts. My ancestor, Leonard Bennett, was crammed into a pew with George Johnston, and Samuel Rowsome but they were up close in “the seat below the pulpit on the south side,” assigned under number 7 in the second sequence. This must have been an undesirable seat, even though it was close to the front, since the minister did not face that direction, and I suspect you couldn’t see anything. It is difficult to discern all of the politics that were evident in how the pews were allocated, but there was definitely a hierarchical structure. 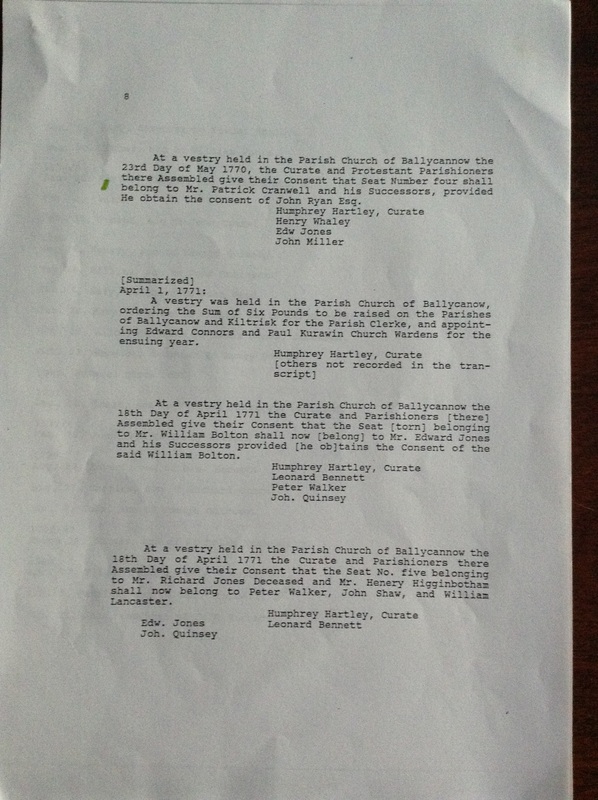 Wish I could send you an electronic copy of the Ballycanew vestry book that I did, but I wrote it on one of those large old floppy disks that were around in the early 1990s, and no computers will read those any more. Your advice is needed again!! 31 March 1812 Pew No. 4 was vacant and conferred to Thomas Godkin and family.was this the original Pew of Cranwell/Bulger? Would this be the same Pew No. 4 that was later allocated to Patt. Cranwill and his successors and be the same Pew No.4 North Side transferred 1818 by Peter Cranwill?? I am sure by now that many descendants will have picked up the name Colley coming through the Cranwill family. Possibly the best way to track this family has been by way of the charts I have been providing. Jane “Ann” Smith who married Patt Cranwill of Ballinemony, Ballycanew, County Wessex, was the daughter of Thomas Smith and Dorothy Colley of Ballyduff, near Balleycanew, County Wexford. I found links to John Colley Smith, who was also known as John C Smith whilst researching old Irish newspapers on the Cranwills. It soon became obvious that he was a brother to Jane “Ann” Smith, who married Patt Cranwill. 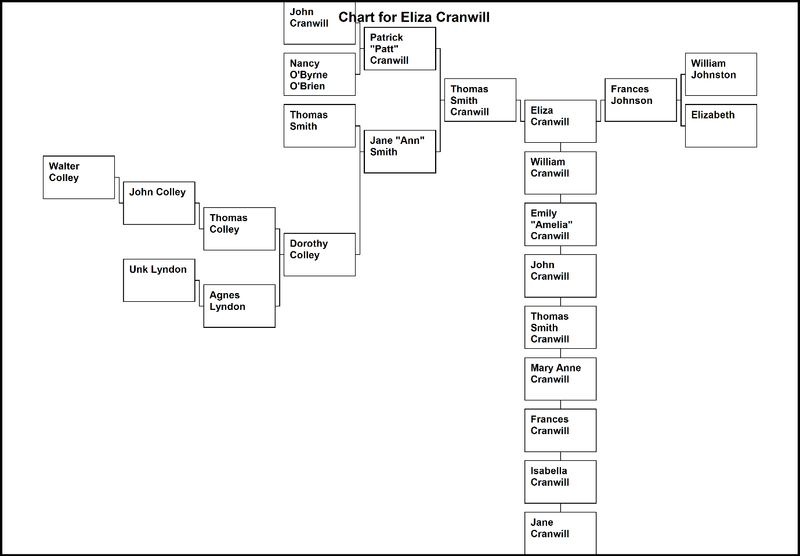 As the great uncle to Eliza Cranwill his family line would have been known. 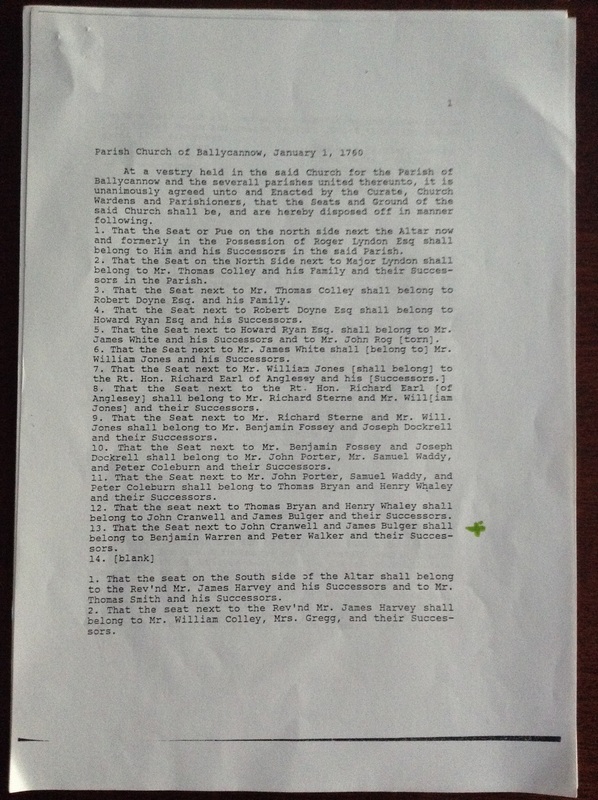 Please see the documents in the following pages which link the Cranwills and Smiths upon John C Smith’s death. The important link with John is his middle name of Colley, which helps to confirm the link back another generation, as Dorothy Colley’s parents were Thomas Colley and Agnes Lyndon. Therefore on Dorothy Colley’s marriage to Thomas Smith she gave her son the name John Colley Smith, in honour of her grandfather John Colley. 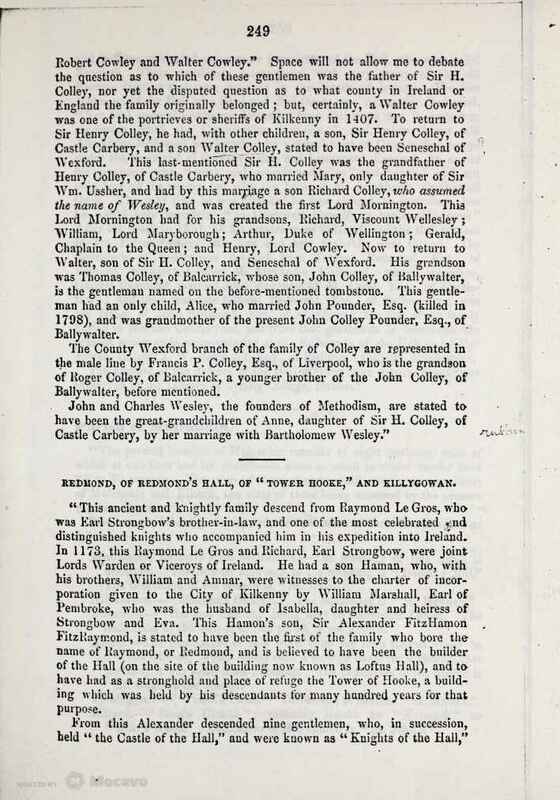 It is with this generation that many articles are written about the Colley family, linking Thomas Colley and Agnes Lyndon back to very early Irish gentry, the Colleys of Carbery Castle, County Kildare. Our line carries the name of Thomas Smith down through the Cranwills with Patt Cranwill and Jane Ann Smith giving their son the name Thomas Smith Cranwill after Jane Smith’s father. 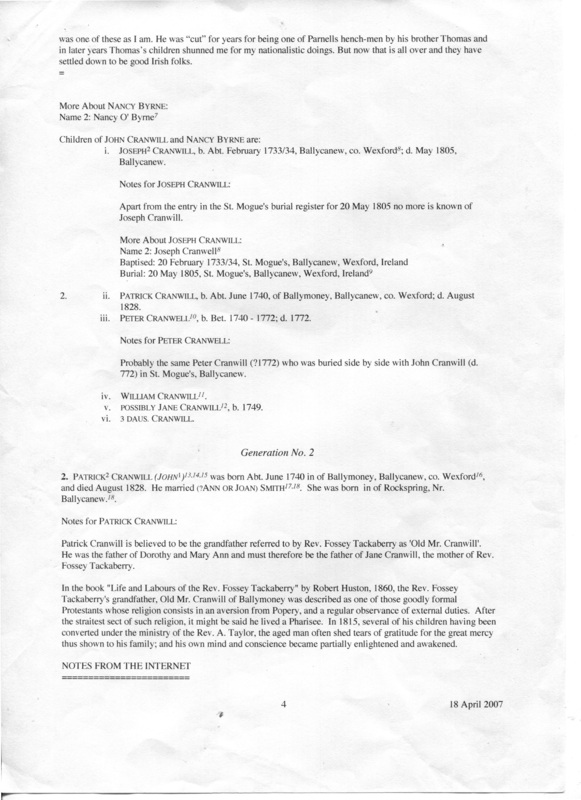 There is no doubt that these links are significant and most interesting for our family and the documentation through Irish Gentry is supported by the many historians who have recorded this family line. Unfortunately there are no baptism or marriage records to rely on, and these documents were no doubt blown up in the fire at the Dublin Records Office in 1922. There are however many excellent research documents regarding the Colleys, and the reason for this huge interest in our ancestry is due to the Duke of Wellington, whose ancestry line also follows our line for many generations. More on this later. It is not clear how long this home was in John Colley Smith’s family, but it is a nice document which links the death notice to the family home. 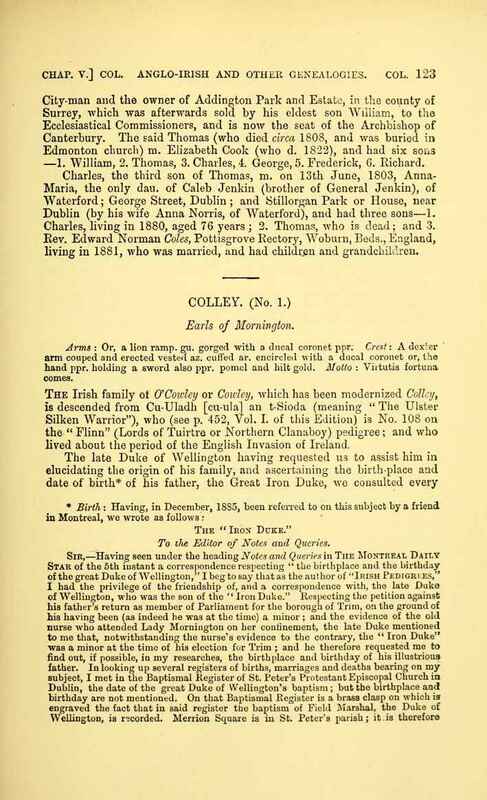 It is interesting to note that Thomas Colley Smith’s Uncle John Colley Smith married Anne Brownrigg, and it can be no coincidence that the neighbours of the Smiths in Wexford was Brownrigg, as mentioned in the previous Guide Book to Ireland image. 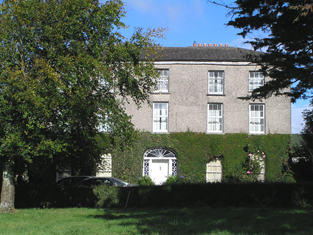 Ballyduff was the home of Thomas Smith, the father of Jane Ann Smith, who married Patt Cranwill. 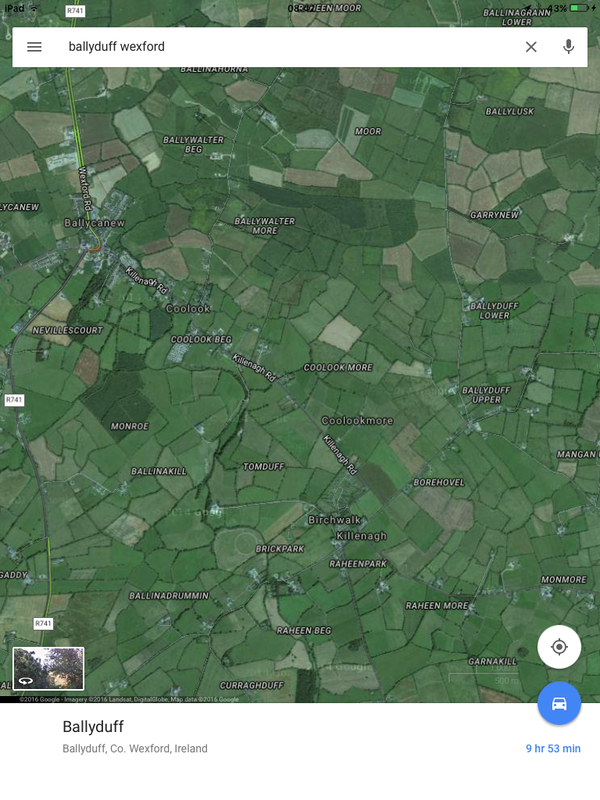 Amazingly Cranwill land’s Google map shows Ballyduff close to Balinemony. It would seem prudent for these families to intermarry to keep retain their land holdings, a common Irish tradition. Our family are lucky that a document remains from Gloucestershire of “Notes and Queries” 1890 edited by Rev. Beaver H Blacker and published in London, England that same year, stating the Colley line. 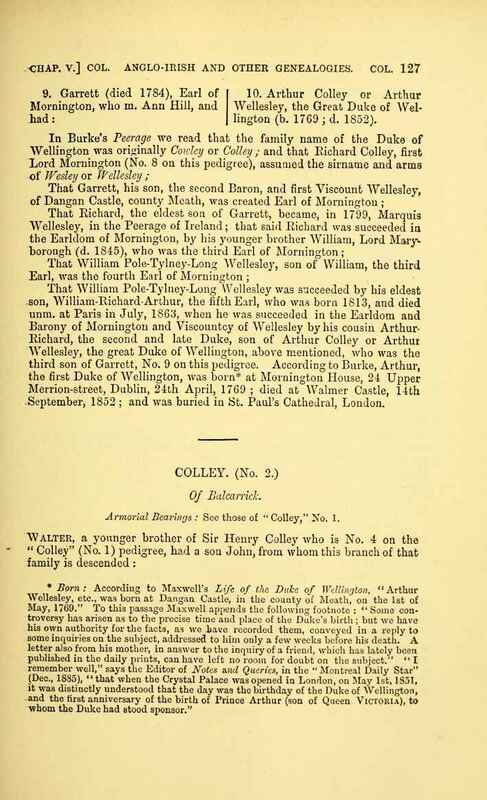 This is most probably due to his interest in the Duke of Wellington, however most importantly he explored both the Duke’s line and our own descendant line, and this was the only way I could reliably and firmly place our family into the Colley family, as whilst other sources were informative, none were secure. The family tree above is a most helpful tool to easily explain this connection. 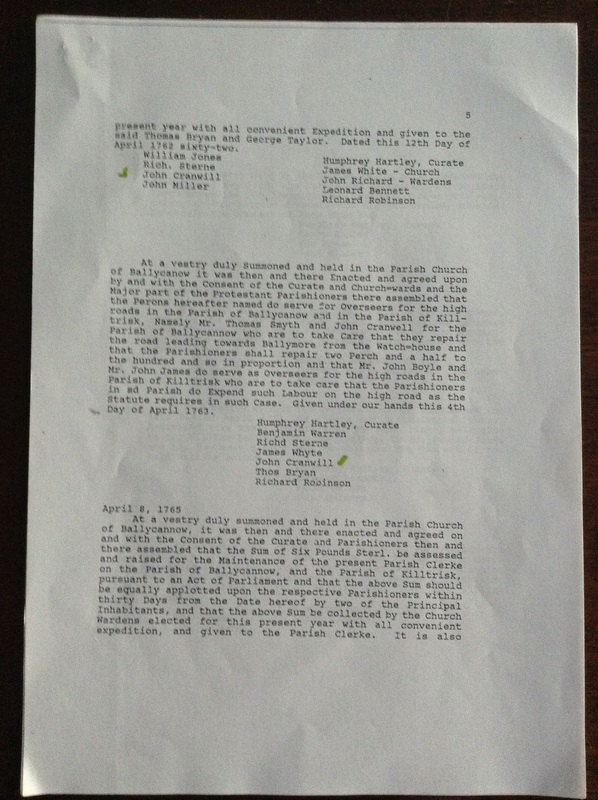 I consulted many online documents and after several days of study I wrote a short synopsis on my work and sent it to my sister, Lavinia, and to my sons Jeremy and Rowan in an email, as a way of recording my thoughts and showing everyone how amazing our Irish heritage was. Even today when I am writing up the family history, I just couldn’t resist popping in this email written to the family exactly three years ago, when I was still quite new to genealogy. I could see the excitement coming through about my latest discoveries. I think finding out about the significance of the name Agnes was one of those defining moments in my family research. Subject: How many people have Napoleon and the Duke of Wellington in their family trees! Here is my latest jag, which has taken me several hours over several days to piece together. I don’t mind if you don’t read it, or just LOL( Laugh Out Loud). I am writing this down before I forget my research and my links to this piece of our family history. Robert Cowley or Colley was born about 1470, see link below, he is our 11th Great grandfather. I can possibly go back one more generation at this stage to his father Walter, but I have not gained sufficient pedigree sources to confirm this yet. The article below is from Wikipedia, the sources of this dictionary are compiled and edited by www contributors. Whilst sources are checked and verified, it is open to worldwide authorship, and thus has been criticised for being open to misinformation, alterations and inaccuracies. Anyone found to be deliberately mucking up the honorary system is barred. Interesting to see that Robert is the start of a huge pyramid of descendants. The Duke of Wellington being one. 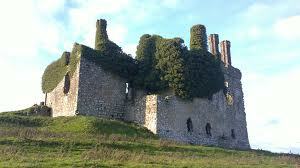 Robert is regarded as the founder of one of the great Anglo/Irish families in recorded history. Our Walter, Robert’s son, was the Solicitor General of Ireland in 1535. Walter is our 10th G grandfather. Robert’s elder son, also called Robert was slain by rebels in 1572, he had no issue. Robert had been granted land in Castletown, in King Country where he was proclaimed a Justice of the Peace by Queen Elizabeth. The rebels, I would think were the Irish Catholics who had been shunted off their lands by the English invaders. Unfortunately these new English landowners often had manors in England, and as such could be neglectful of their Irish properties, appointing keepers, wardens and bailiffs in their absence, creating a dangerous livelihood. Rebellions were ferocious with mass slaughtering on both sides. Retribution was also horrific, and the English had the back up of regiments who would swiftly quell the rebels. 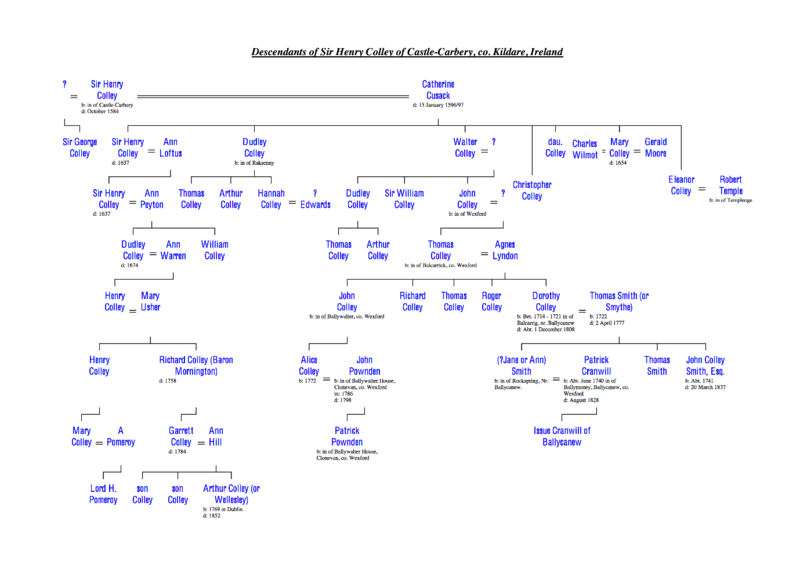 Walter and Anne Colley, had a son called Sir Henry Colley who married Catherine Cusack, who was born on 2 October 1535 at Castle Carbury/Carbery, Co Kildare. Queen Elizabeth granted Henry Colley the manor and castle of Edenberry along with Drumcooley and other lands in Co. Offaly. In a previous email I wrote to Lavinia telling her of this interesting development, with a story about the Colleys obtained from an online tree on ancestry. Apparently Henry Colley is our 9th G Grandfather, but more information than hearsay needed to be done. 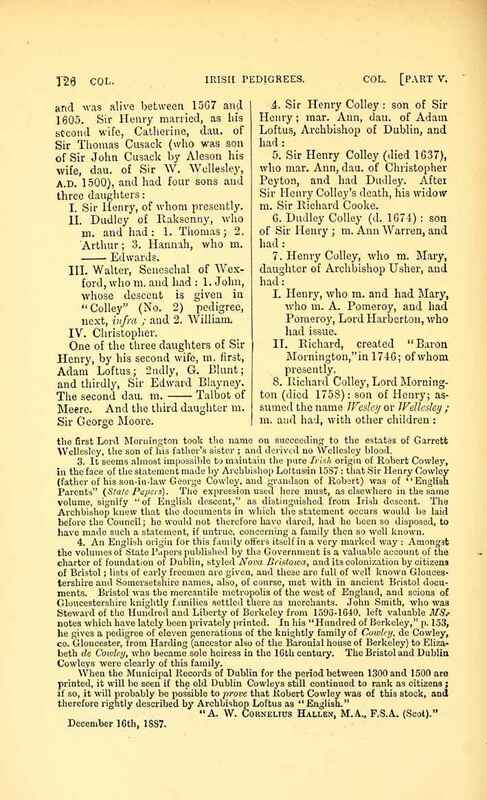 Sir Henry and Catherine Colley nee Cusack had another son, also a Sir Henry, and it was through this branch but down another line, that the Duke of Wellington is related as a cousin in the family. Therefore as Jeremy and Rowan who are the start of my tree Ancestry.com the program works out that their direct relationship to the Duke of Wellington as their 6th cousin, 5 times removed! They had many sons and daughters, one of which is our ancestor John born 1665, the year of the Great Fire of London. I am not able to confirm his wife as yet, but his son was Thomas Colley born 1695 who married Agnes Lyndon. Their daughter Dorothy Colley married Thomas Smith, in turn their daughter Jane Smith married Patrick Cranwill born 1740. Patrick is our 5th G Grandfather, his parents were John Cranwill and Nancy O’Byrne. Do you remember some time ago I found out that Nancy O’Byrne was thought to be a direct descendent of the famous Irish rebel, Feach McHugh O’Byrne of County Wicklow, who led his Catholic Gaelic Clans into battle against the English? He was beheaded, then cut up into pieces, after the Battle of Glenmalure, on Sunday 8 Mary 1597… This was done by Lord Deputy Russell on the direct order of Queen Elizabeth 1 of England. An over excited Russell then had Feach’s head boxed up and sent to London, where it was presented to the Queen! Apparently she was not too impressed by this gift and her displeasure was recorded in many histories. This wonderful story unfortunately must remain as a very interesting family story, as I can find no documents in its support, apart from some overenthusiastic family researchers on ancestry! I digress, but only to point out that while the connection to Feach is a family myth, the Colley lineage is actually supportable by documents. Patrick and Jane Cranwill nee Smith were the parents of Thomas Smith Cranwill who married Frances Johnson in 1801. Their daughter Eliza Cranwill married James Kilpatrick and as we know, they are buried at Avoca in Victoria. It is interesting that their daughter, our great-grandmother was called Agnes, because today I have found out that this is a family name. When Agnes was named by her mother, Eliza Cranwill, she would have known that her own great-grandmother was called Agnes Lyndon – and now generations later, Agnes Wise is my great-grandmother. Enjoy reading this when you have a couple of hours. My most helpful links below were used to authenticate relationships, amongst many other google searches of English and Irish history. It is all there to find. It is just amazing. All I can think of is that Grandpa Reg Robson would have just LOVED this family story! The transcription of the Gloucester Notes and Queries is attached at the end of this chapter. Whilst the transcription is not in traditional style as set down by Burke’s Peerage, it is quite readable and clear enough for our family to accept that these lines are our direct family ancestors, which is pretty amazing. Unfortunately it does not expand our line after Thomas Colley and Agnes Lyndon, however there is enough information and records to substantiate the further line of their daughter Dorothy Colley and her marriage to Thomas Smith as our direct ancestors. 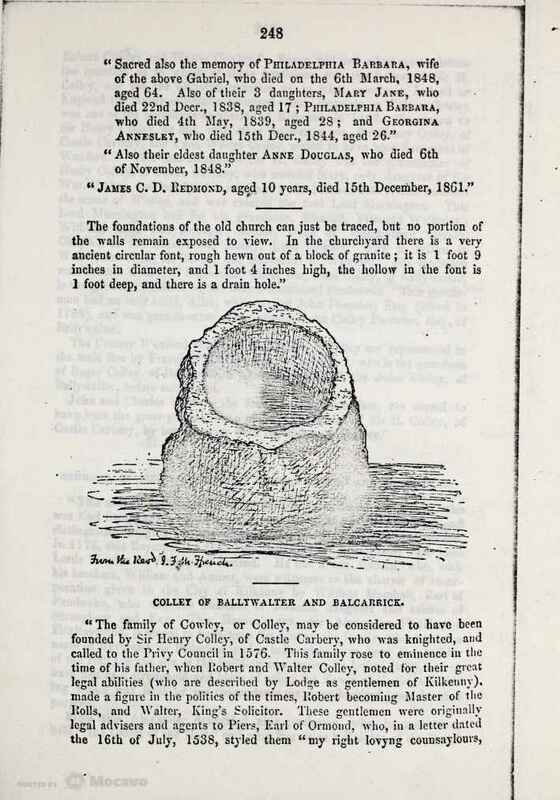 Four pages from an old book recently placed online, entitled Journal of the Association for the Preservation of the Dead in Ireland 1888-1891 Volume 1 pages 246-249. 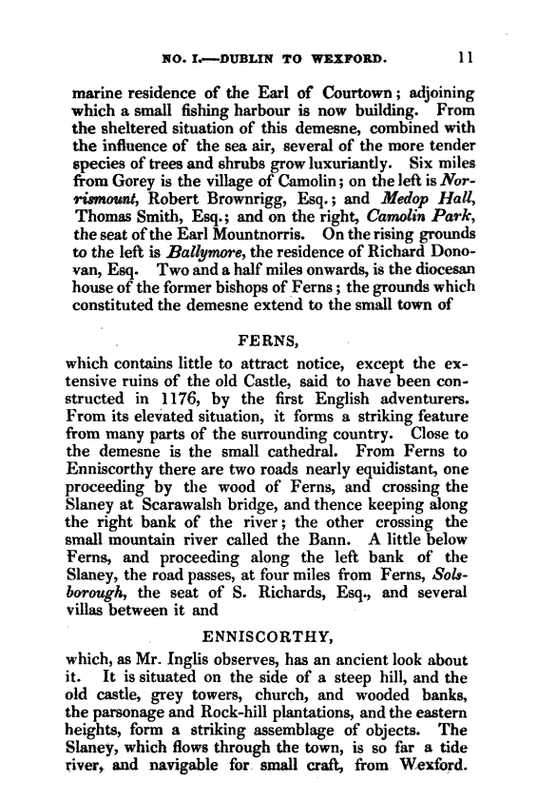 These four pages are most interesting and it took me ages to work out that there is a typographical error in printed book for the name of the town Millenagh, which should have read Killenagh, this was mostly worked out thanks to the Redmond family tree, many of whom still live in the township Killenagh, which is close to Balleycanew. The extraordinary thing about the pages in this book is that the author is obviously knowledgeable about the Colleys, and the relationship with the Smiths. What is amazing is that I have stumbled across the grave of my 5 x great grandparents, Thomas Smith and Dorothy Colley. Thomas’ wife is acknowledged as a Colley, her parents being Thomas Colley and Agnes Lyndon. This is incredible information that I never expected to find, and only released online in January 2014. Each and every time I Google on the www there is something more there for the researcher! However it leaves me now with no doubt to this lineage. Long forgotten and dusty books lying on upper shelves in homes and libraries are being released on the internet, as scanned copies, many freely available, and they are bringing so much valuable information about the past. Valuable information about the whereabouts of this graveyard came about with the collaboration another fellow Cranwill researcher Rosemary May. Similarly to my Wise research comparing old maps with Google maps helps identify relevant sites. I stand in awe and amazement of my Grandmother Mabel Wise’s pure Irish and most distinguished ancestry. Personally, it has been an amazing journey of research, uncovering so much about the society, geography and history of Ireland, and finding out exactly where our family fitted into this part of the world. My goal was to take the Wises and Kilpatricks back to Ireland, and it has taken me several years of research. However, I am lucky that I had at my fingertips the internet, it was far harder for previous generations to piece these things together than it was for me. They had to make enquiries by way of writing letters, visiting libraries and by accessing registry offices; it must have been laborious and difficult work. For that reason we must be very grateful for the Family Tree document that Aunt Irene Borthwick nee Wise accomplished. Family histories are never finished, and I only hope one day that our family can uncover Mabel’s ‘Kilpatrick’ ancestry line, perhaps with the advent of DNA family research this will be accomplished sooner than later. I hope everyone who reads this has enjoyed my journey taking our family back to Ireland. It has more than fulfilled my expectations, and I would like to dedicate my Irish research to my dear Dad, Reginald George Robson, who, in this the centenary year of his birth, would have been absolutely delighted by my research on the family tree, and more so my determination to write it up. Following Geoff’s and my trip to Ireland in 2016 there was so much more information to write up and this resulted in another chapter The Cranwill, Colley, Lyndon and Newburgh Families of Ireland and England which expands a major breakthrough when I discovered that the Lyndon family was descended from the very old and noble Newburgh family. 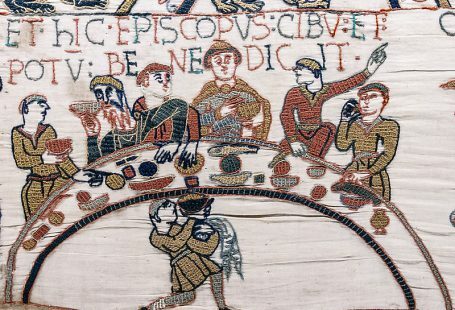 The result is that this line can be traced back in a direct descent line from William the Conqueror and generations before the Norman Conquest. 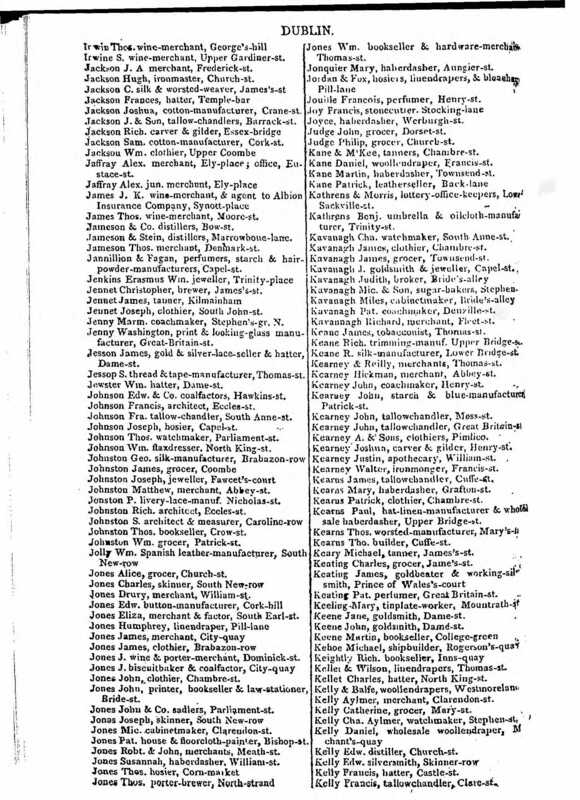 Transcript taken from: Gloucestershire Notes and Queries, Vol. IV, 1890. Edited by REV. BEAVER H. BLACKER, M. A. Published in 1890. London, England. In Vol. IV of the Gloucestershire Notes and Queries for 1890 between pages 563 to 566. Robert Cowley, of Dublin, And His Line. About the year 1460 was born Robert Cowley, a man of some mark, and the first known ancestor of Arthur Cowley, or Wellesley, the great Duke of Wellington. Readers may find frequent mention of Robert Cowley, or Colley, in the Calendars of State Papers; in 1530 he had two sons who held high posts in Ireland, and he himself is styled “Old Colley.” Modern peerages state that the earliest known ancestor of the Duke of Wellington was an English- man of a Rutland family, living in Ireland. 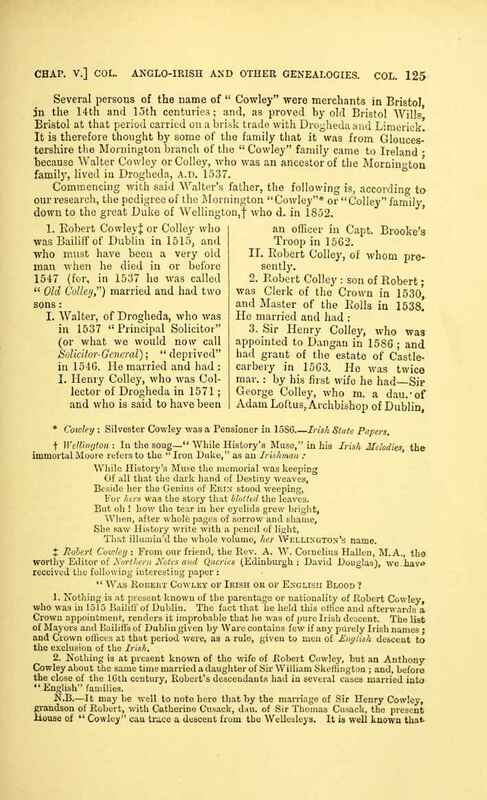 Robert Colley is styled in the State Papers an Englishman, but only in the same way as were the Cusacks, Wellesleys, and others who had lived for centuries within the English pale. There is nothing to show that his ancestors were connected with Rutland. His earliest public appearance, in 1515, as one of the two bailiffs of Dublin, would point to his being descended from the Cowleys who removed from Bristol, and continued to hold a good position in the city of their adoption. From him the descent may be briefly given. 1. Sir George, who married a daughter of Archbishop Loftus; he styles himself “of English birth,” and left issue. 2. Sir Henry, who follows as IVth of the line. a. Dudley, who had two sons, Thomas and Arthur. (a) John, of Ballywalter, who left issue a daughter, married to Capt. Pownder. (A) Arthur Roger, born 1852. Duke of Wellington, born 1769, died 1852. N.B.- The late generations of this branch of the family will be found fully and correctly given in modern peerages. The following document was written by Margaret Greenwood and who kindly sent me a copy and gave me permission to reproduce it in this chapter. 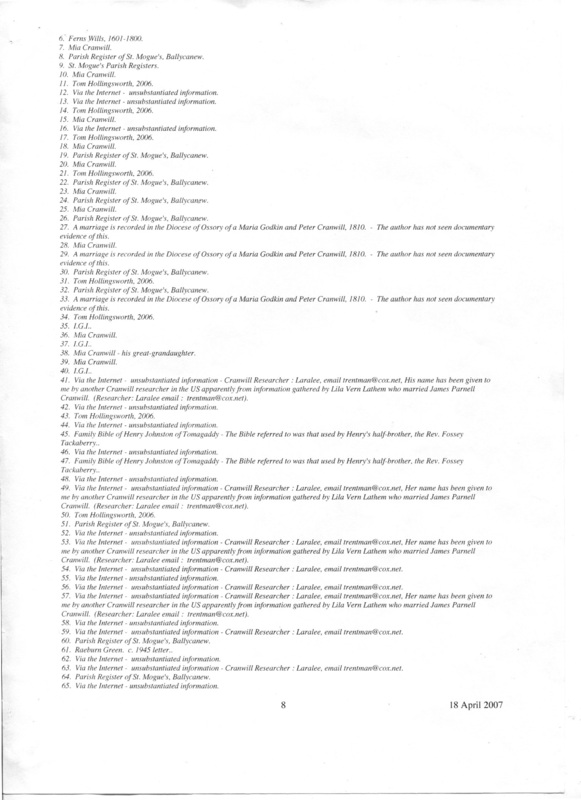 The following six pages are taken from a newly uploaded online book (2013). 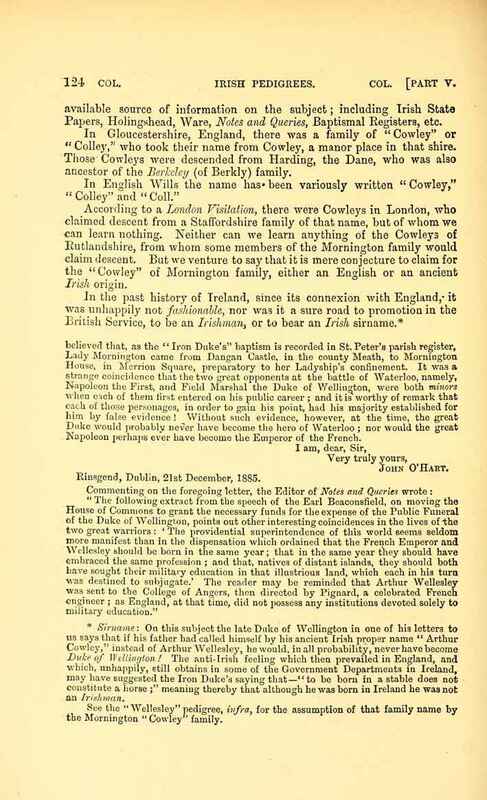 The Origin and Stem of the Irish Nation, a ‘dusty document’ rescued from the shelves of an Irish Library, this book was written by John O’Hart and published in 1892. It is the leading Irish Pedigree Reference Book for family researchers and was acclaimed by his peers at the time as accurate and authoritative. Hi, my husband is a direct descendant of James and Eliza, and I have been researching the family after the recent death of his father. It has started me on the family history journey, as I have inherited all the family documents and photos, some going back 150 years. I thought for a small moment that you had solved the mystery of a sister double wedding photo at least, when you mentioned Jane and Agnes marrying the Wise brothers I thought yes this is it, only to retrieve the photo and the 2 boys are in WWI uniforms so can’t be them alas. Would still love to make contact to see if you would like copies of any of the other photo’s, and see if you mind if I use any of your research here.